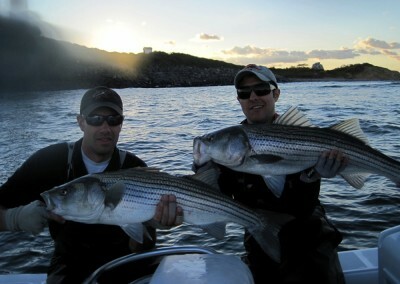 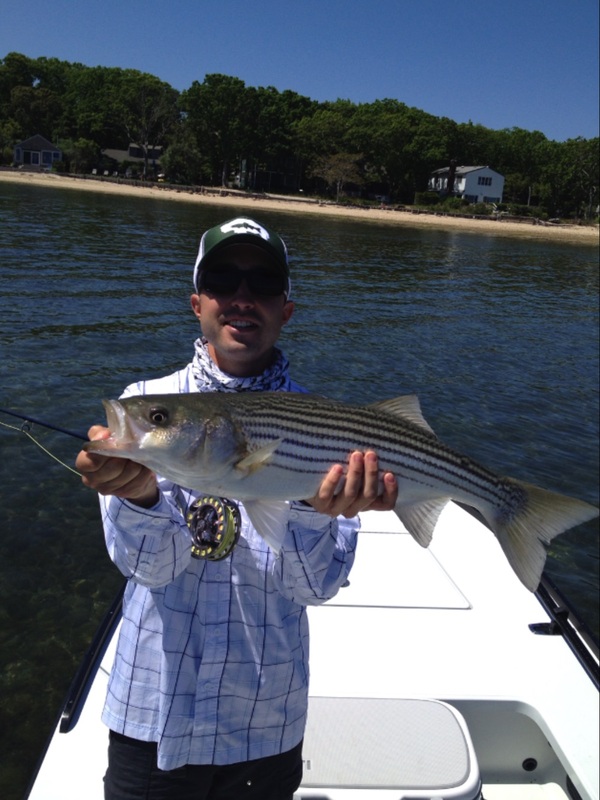 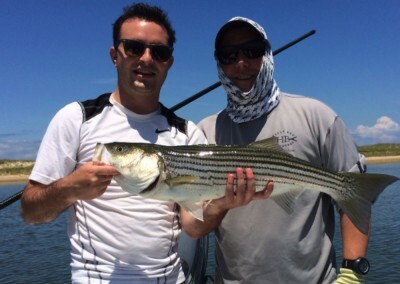 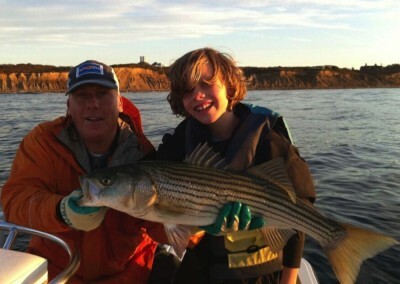 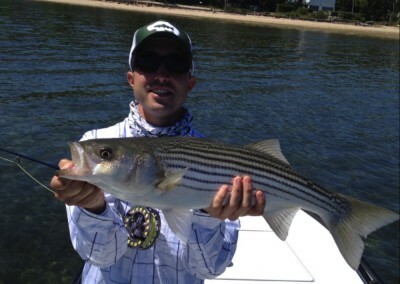 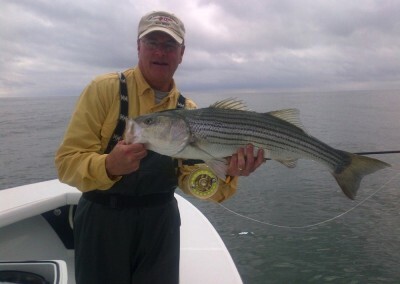 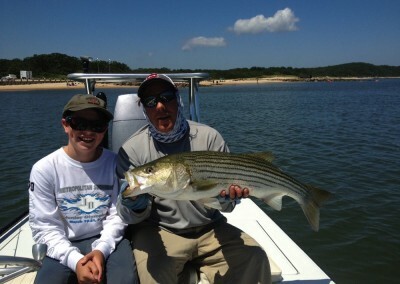 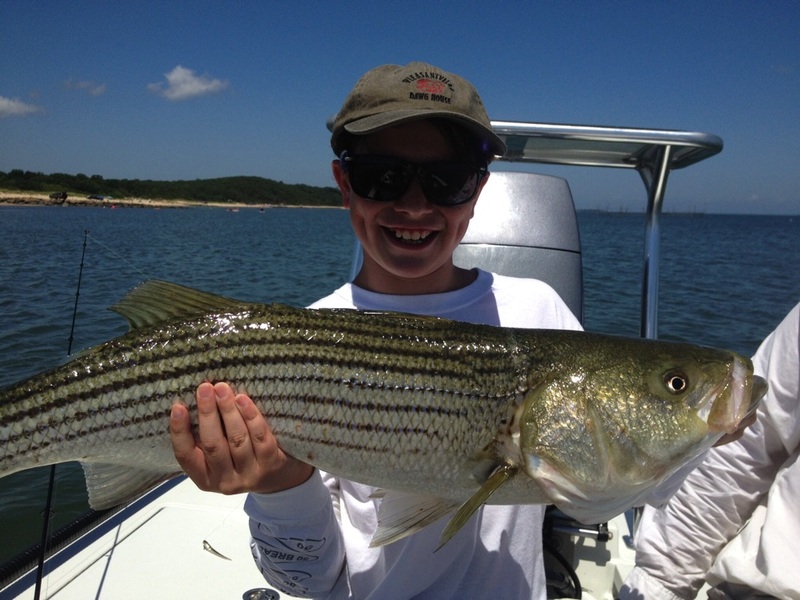 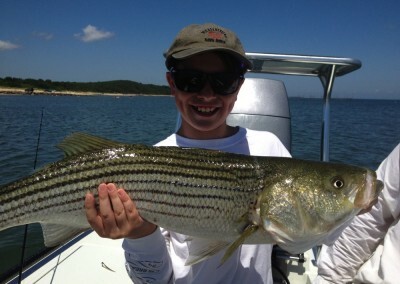 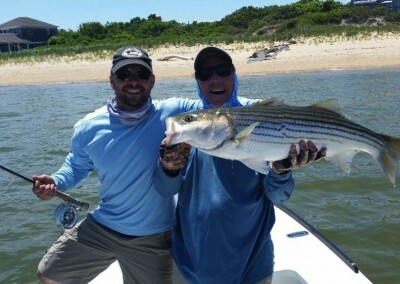 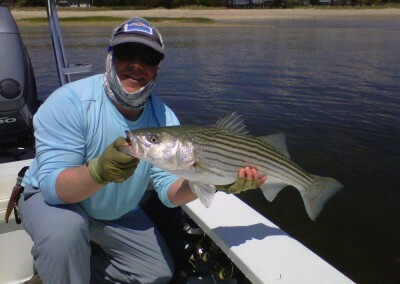 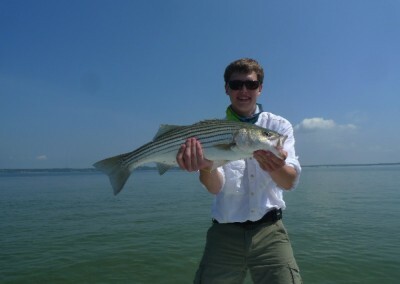 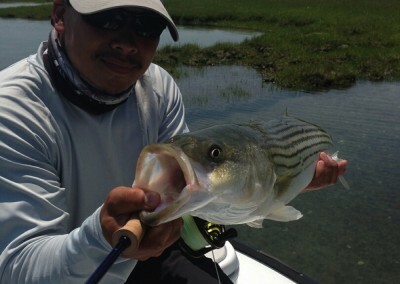 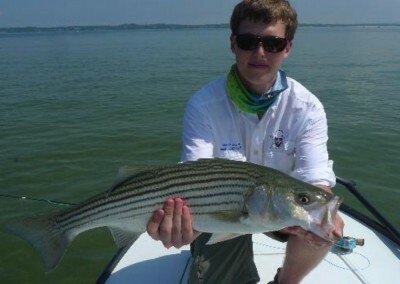 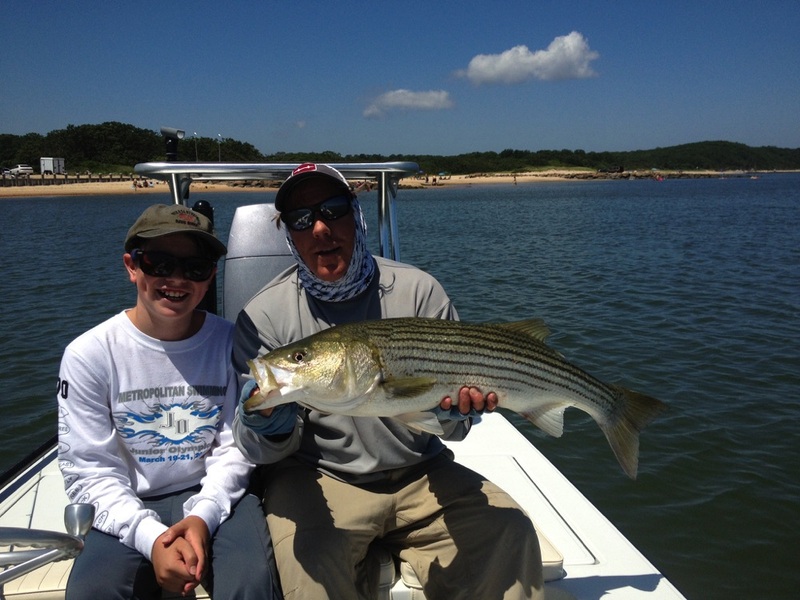 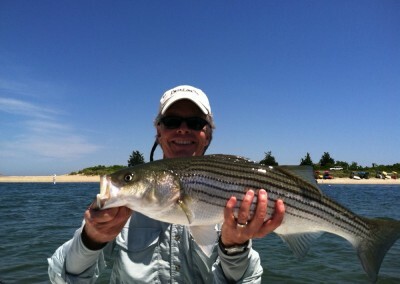 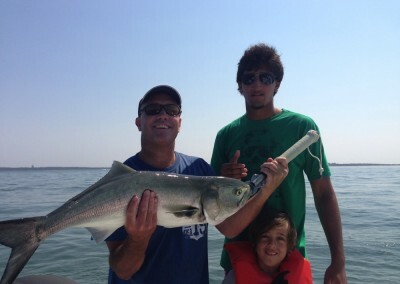 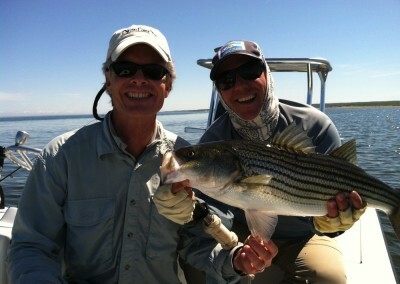 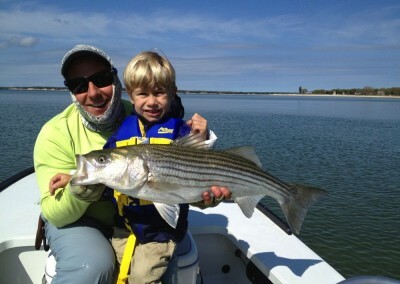 Although my son and I have fished with Merritt on several occasions, spring site fishing for stripers is my favorite. On this particular day in May we were fortunate enough to get shots at several nice fish and landed three beauties on fly. 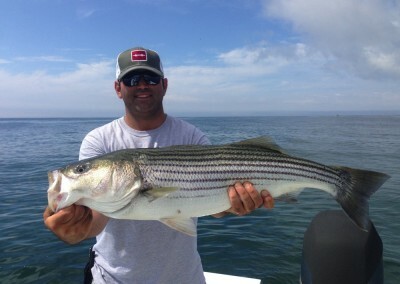 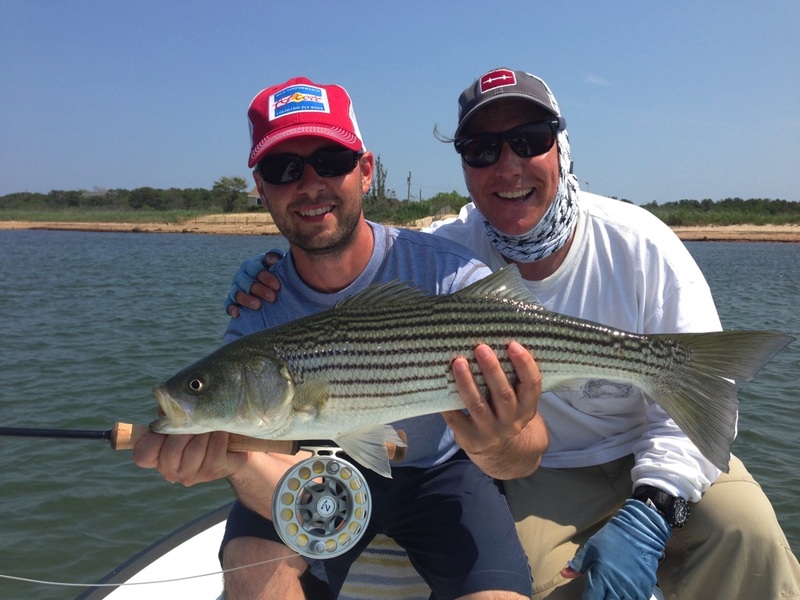 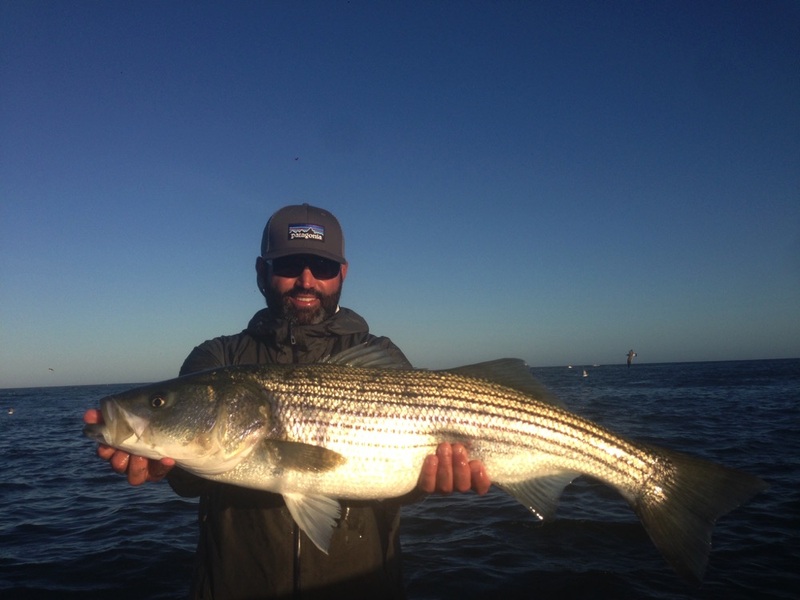 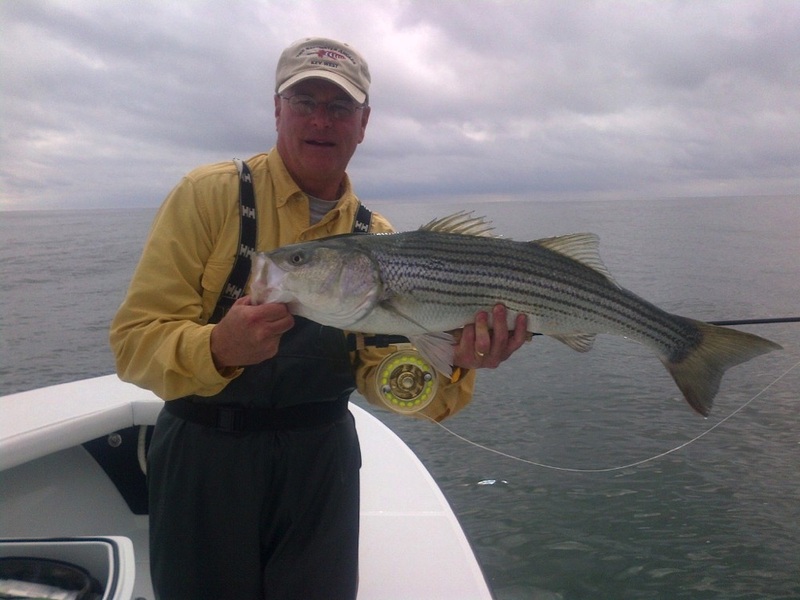 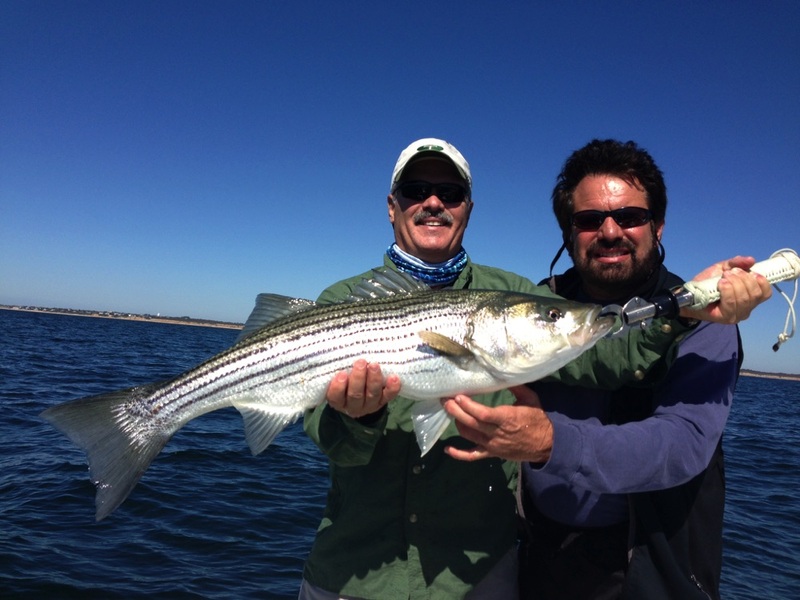 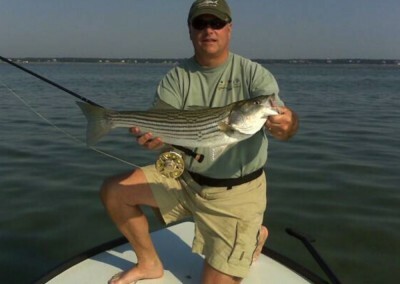 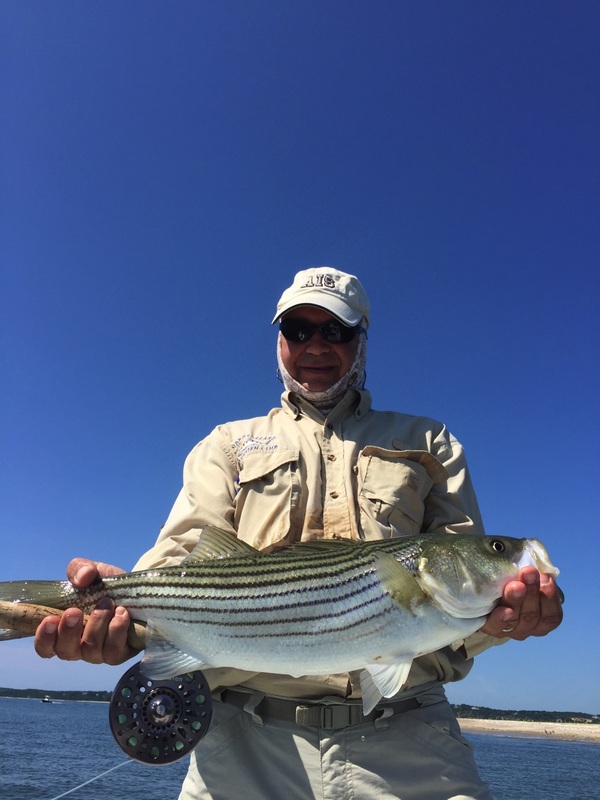 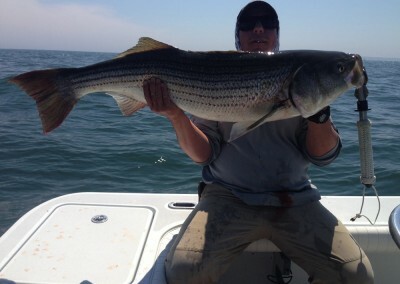 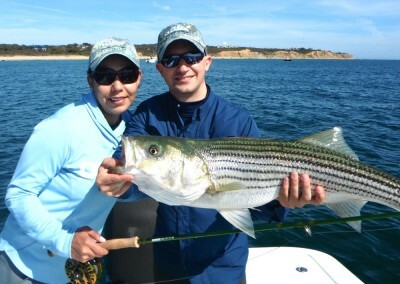 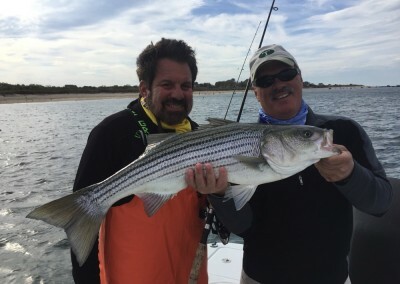 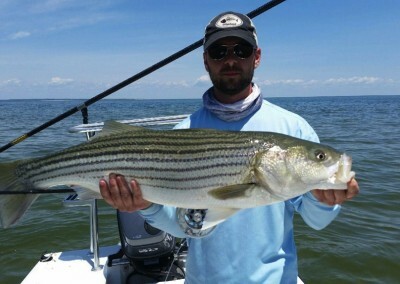 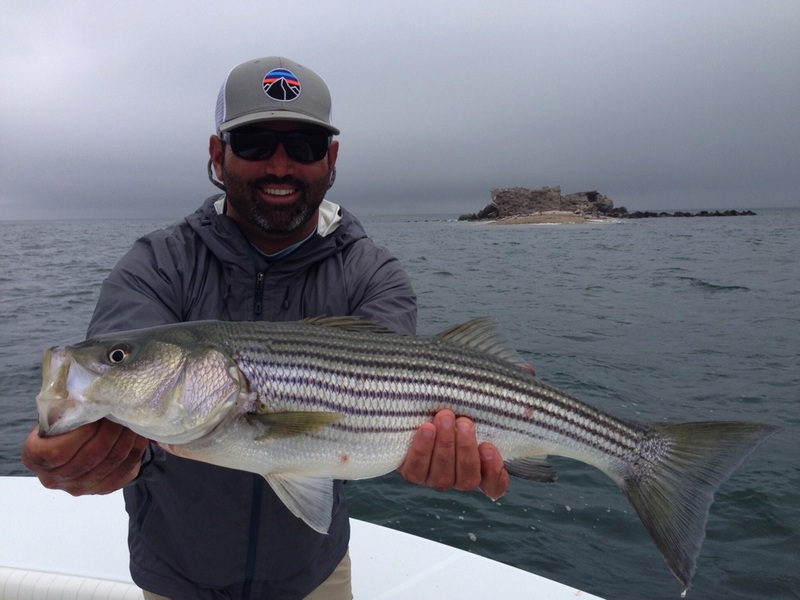 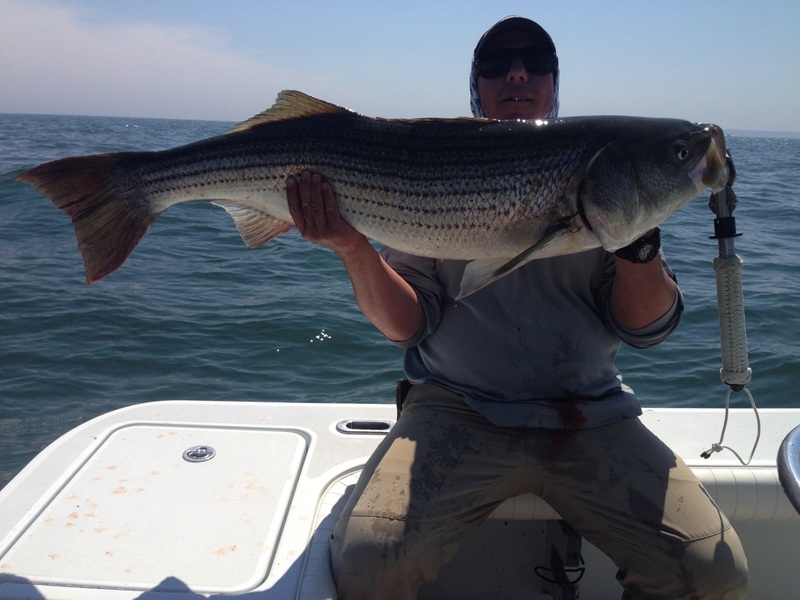 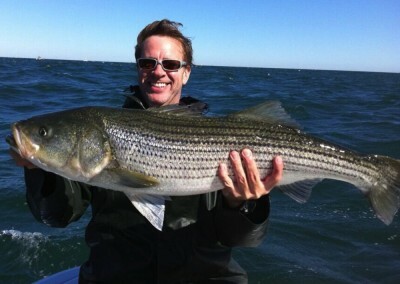 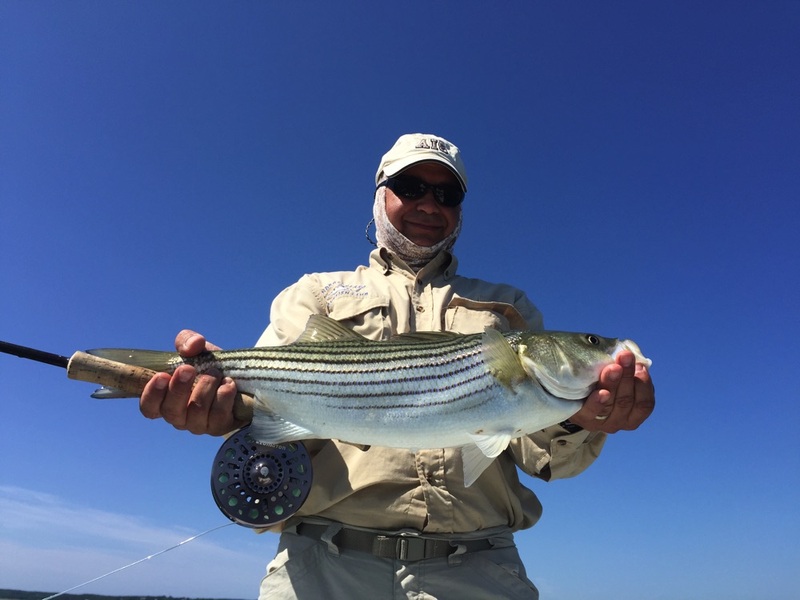 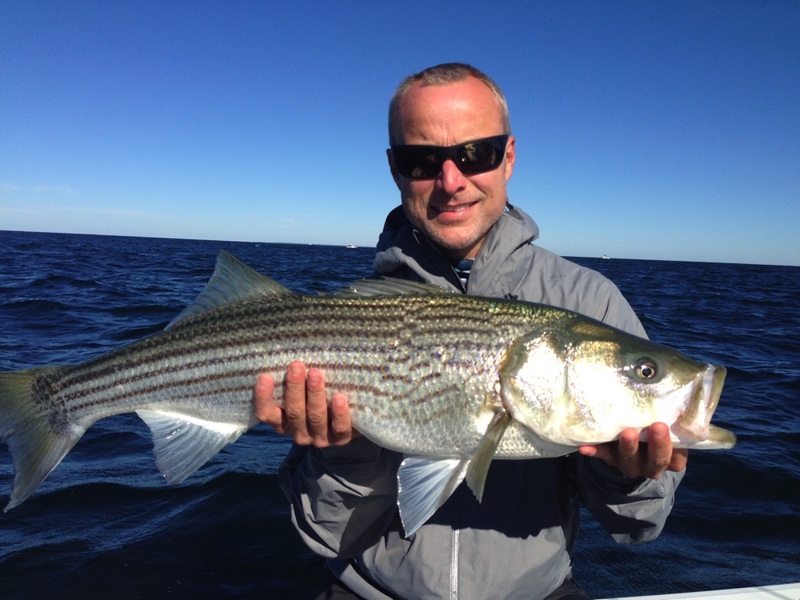 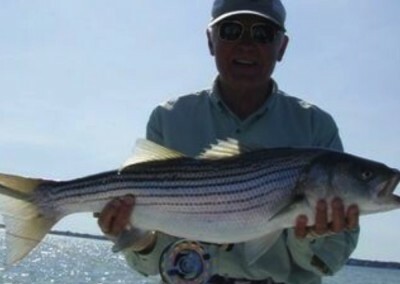 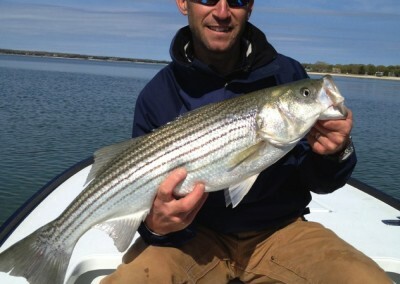 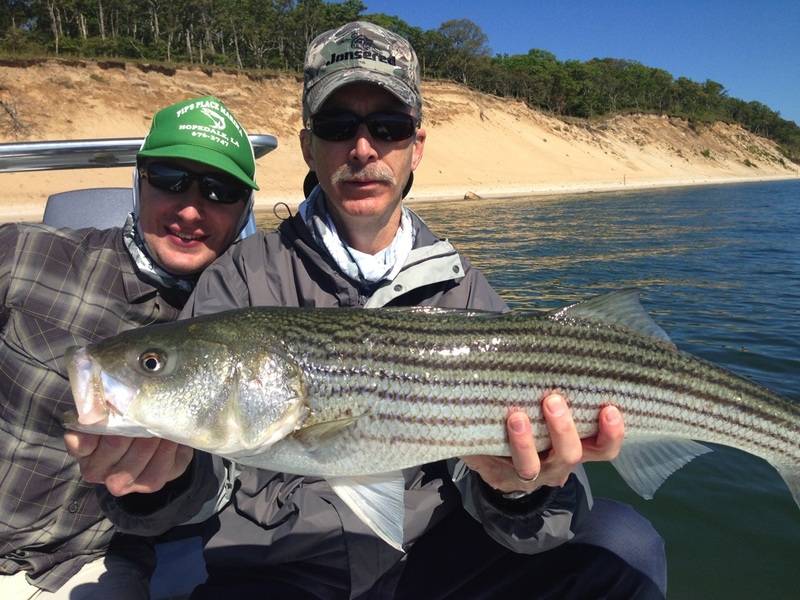 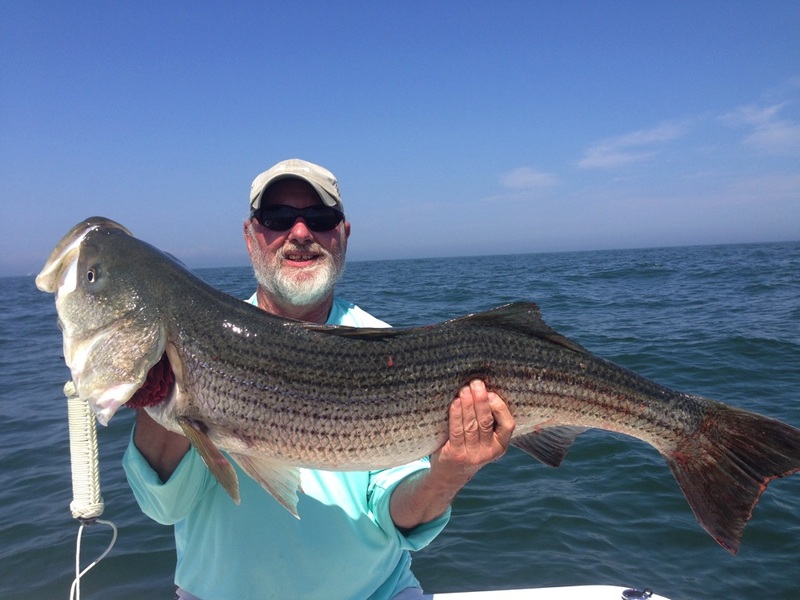 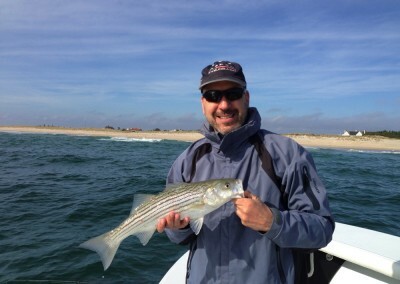 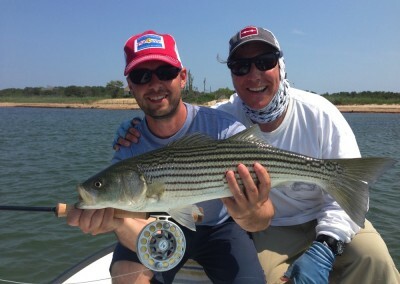 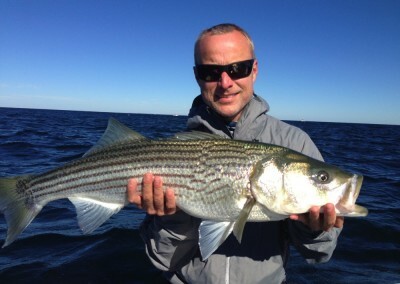 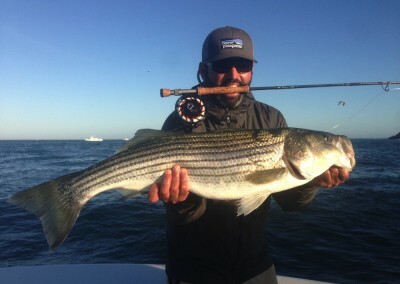 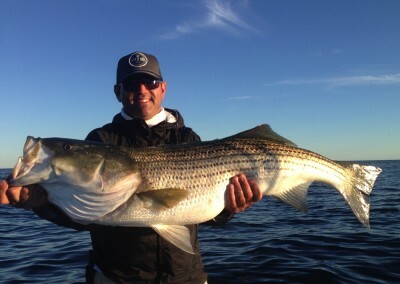 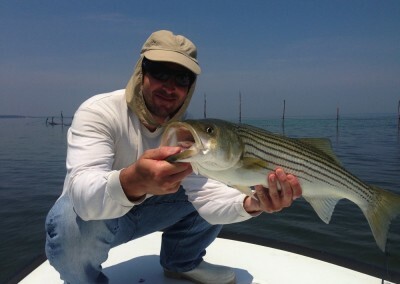 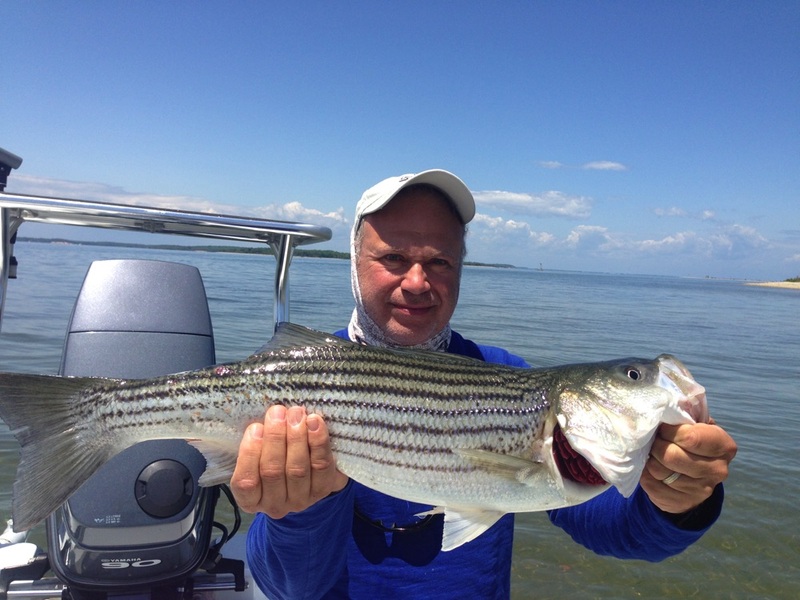 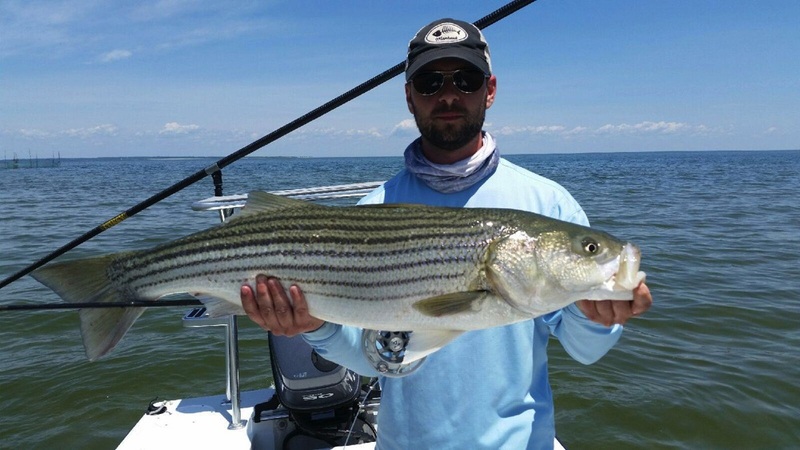 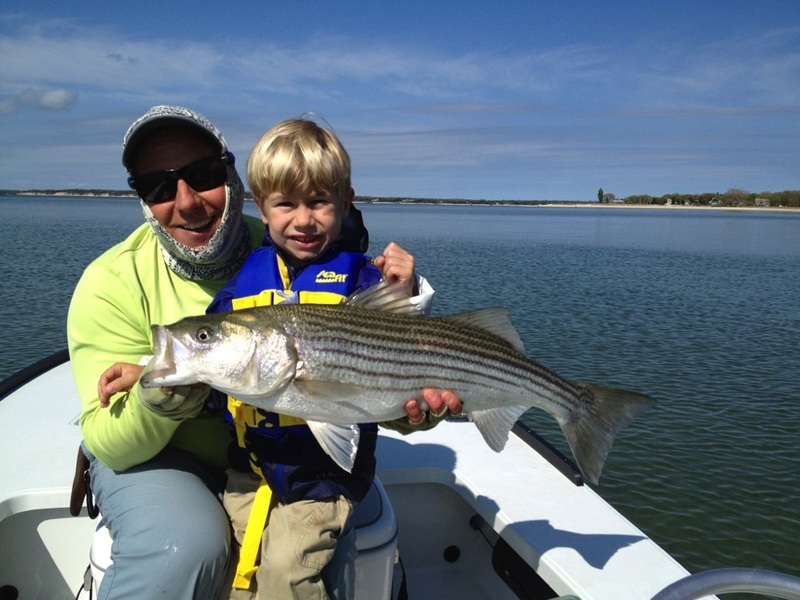 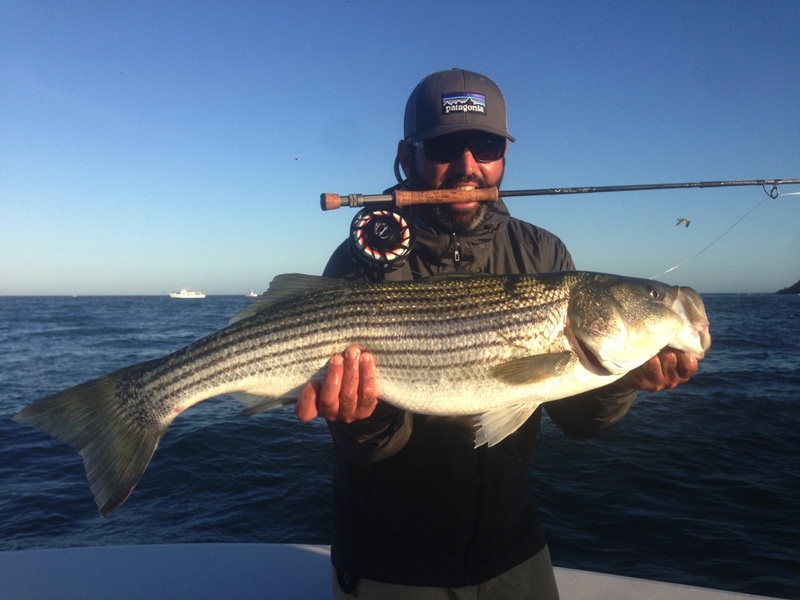 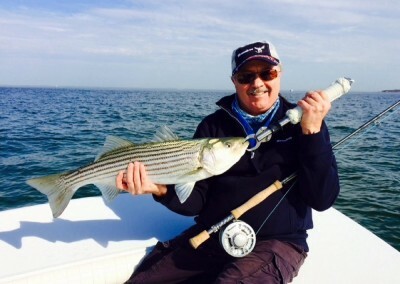 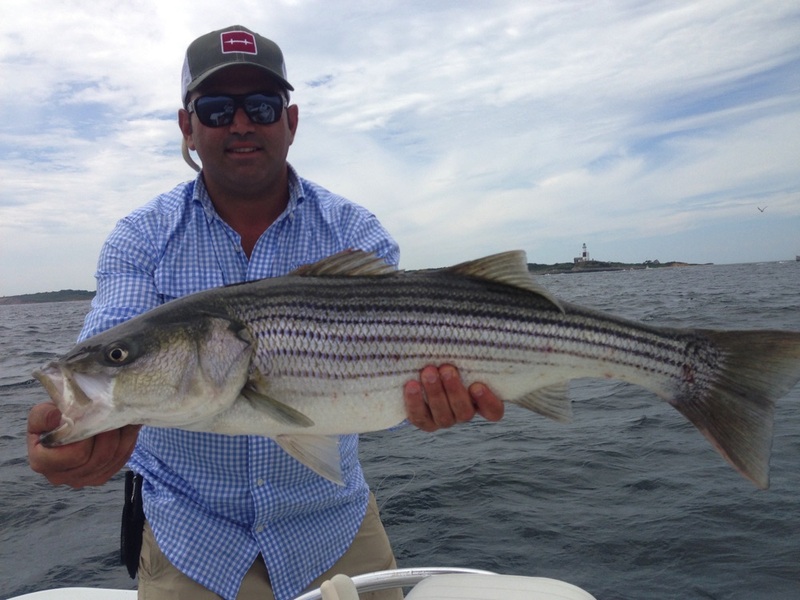 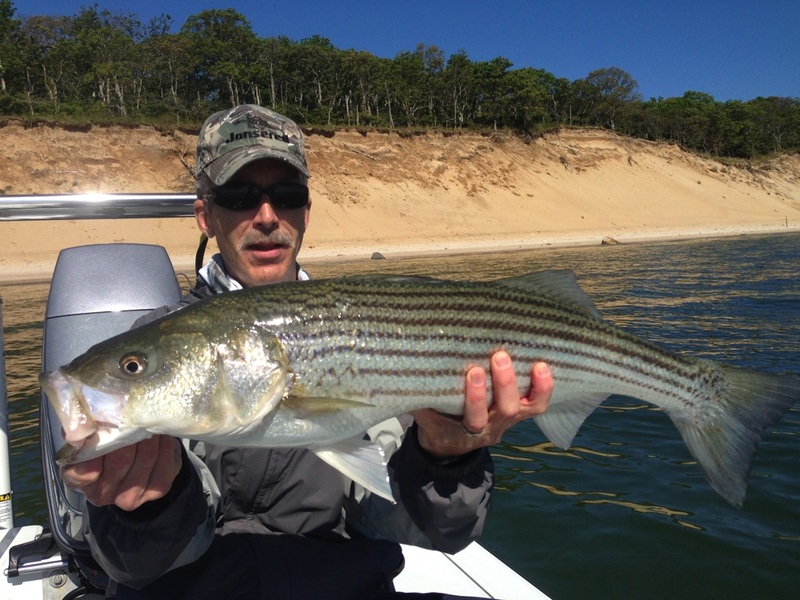 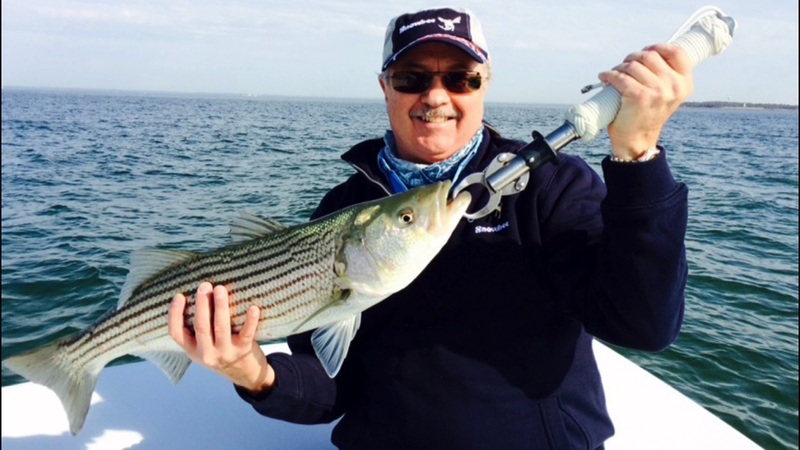 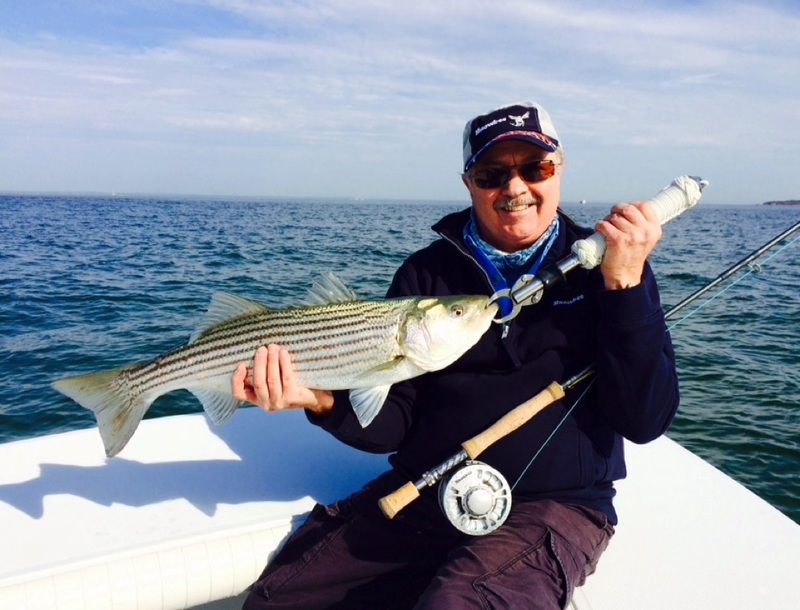 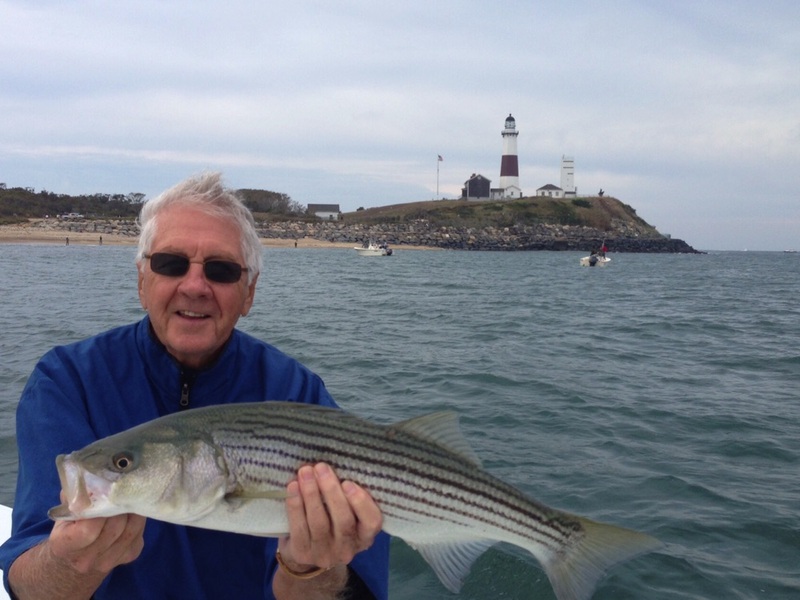 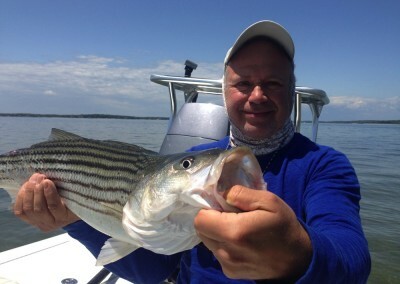 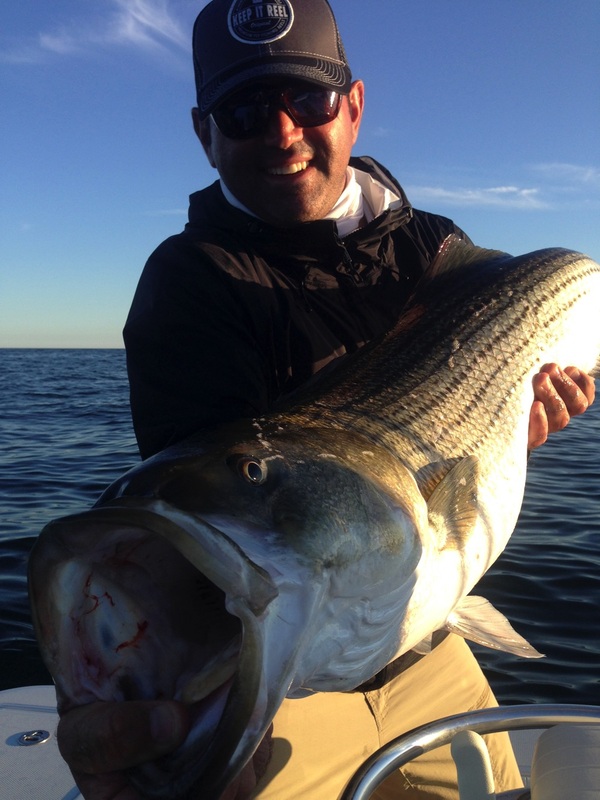 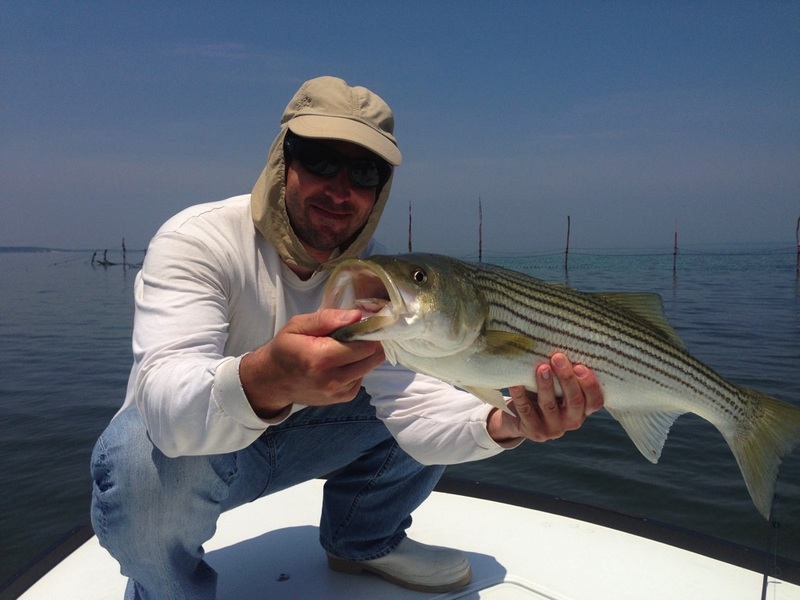 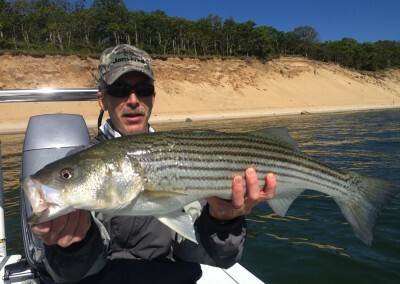 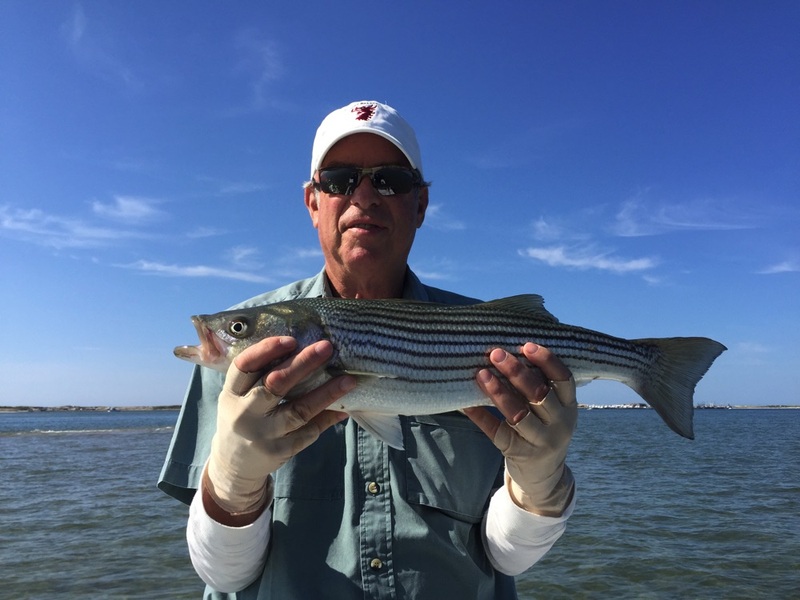 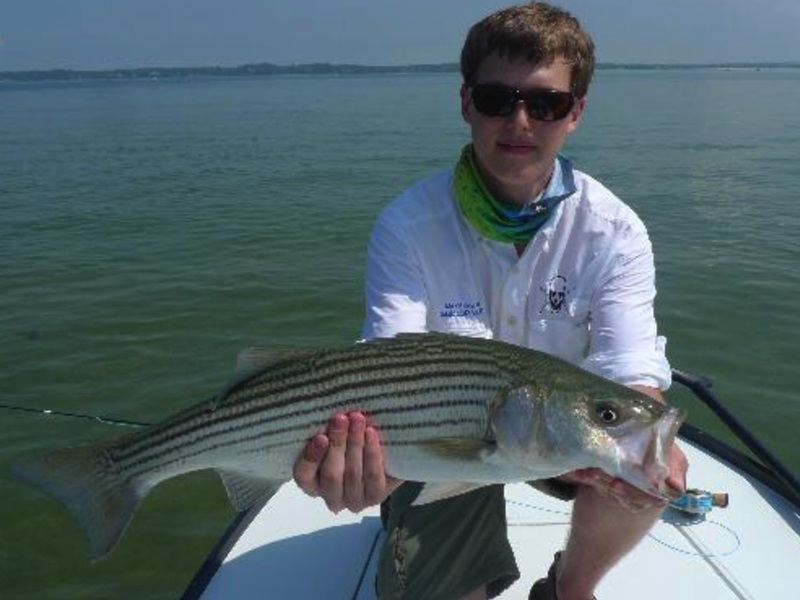 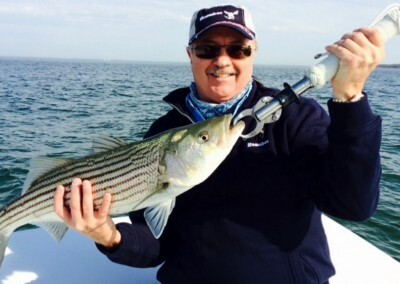 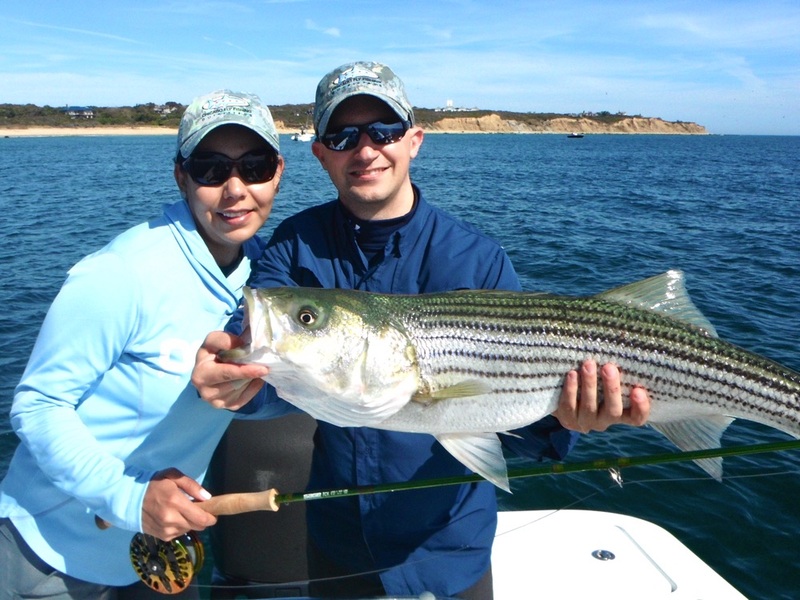 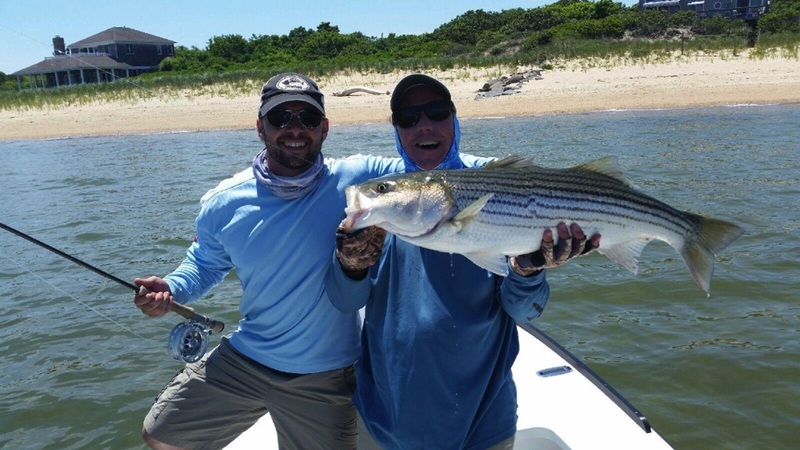 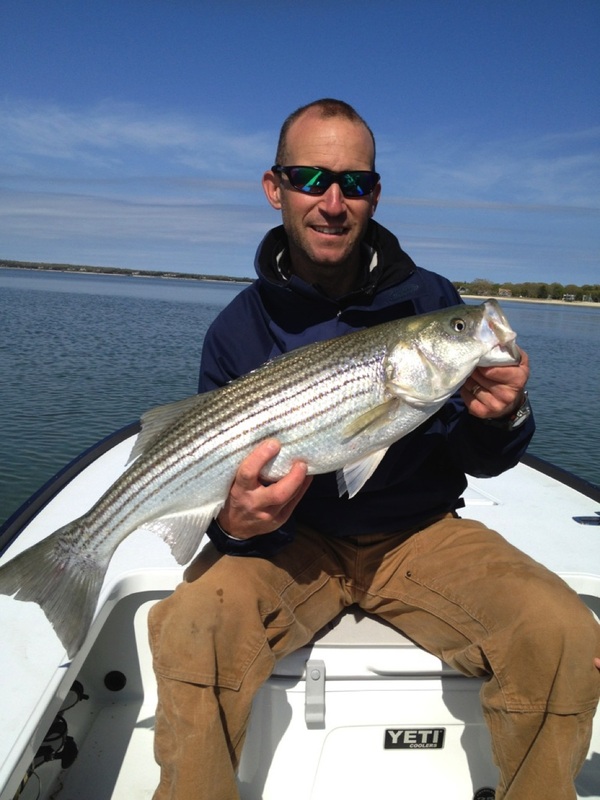 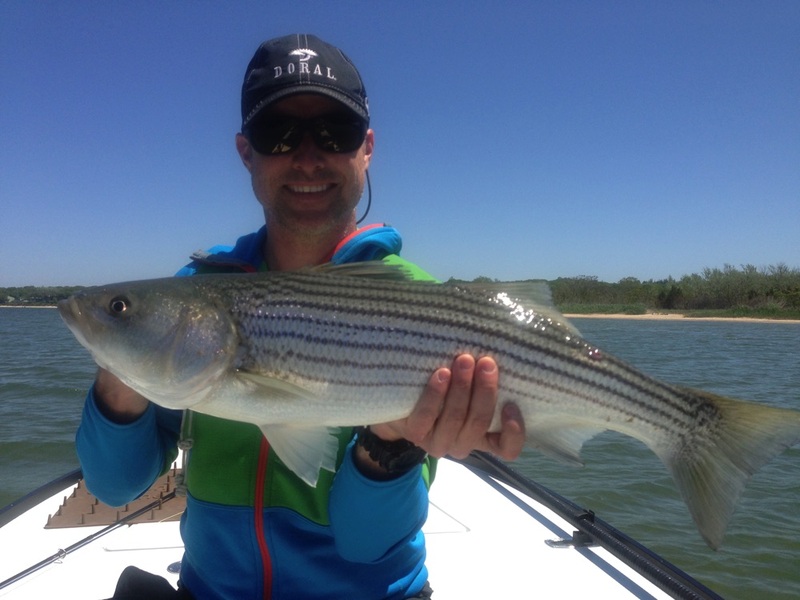 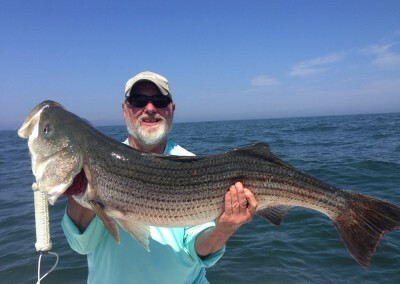 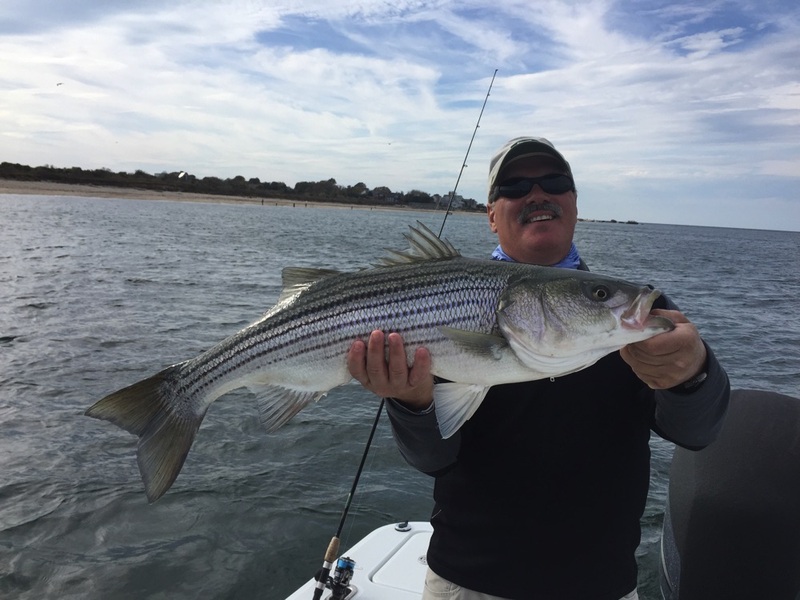 If you’ve ever wanted to sight fish for stripers, Merritt White is the man to see. 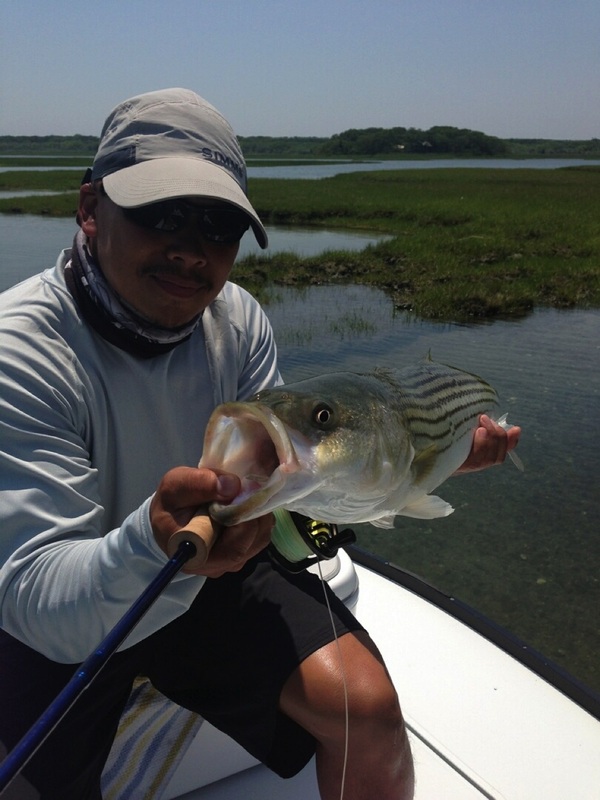 I’ve been impressed on many occasions with his knowledge of the local fishery, and his willingness to work hard to find fish. 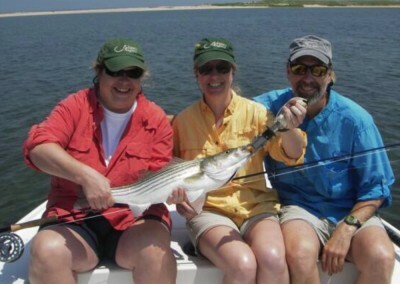 Merritt operates a first rate guide service. 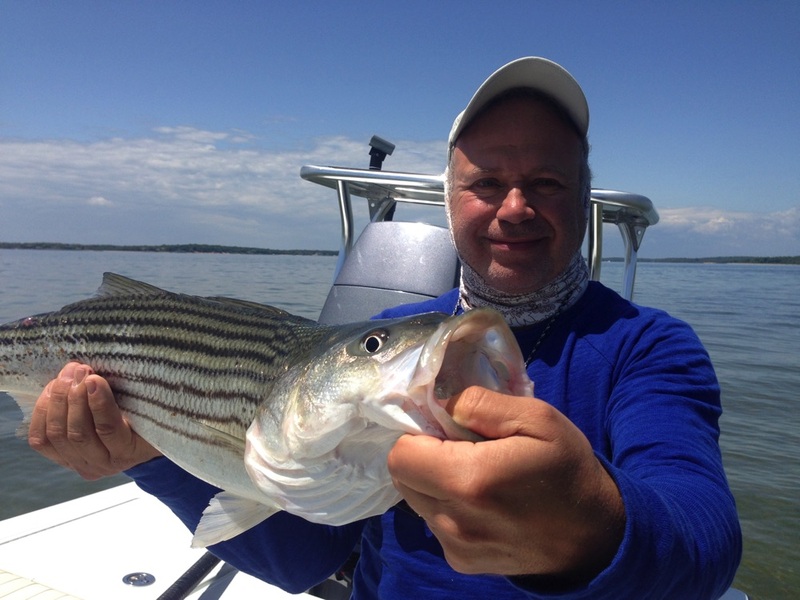 Randy S.
A native of Eastern Long Island, New York, Merritt comes from a long line of hunters and fishermen. 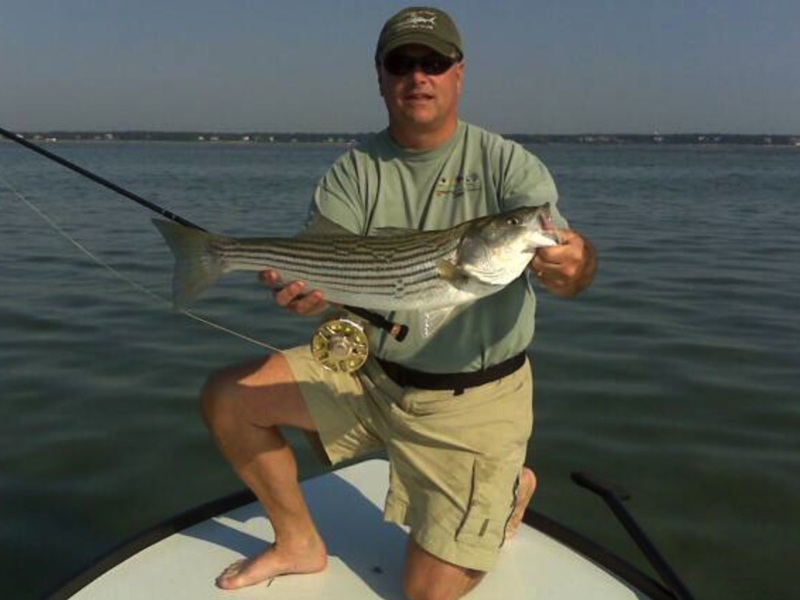 He is a 1989 graduate of St. Lawrence University with a B.S. degree in Biology and Environmental Science. 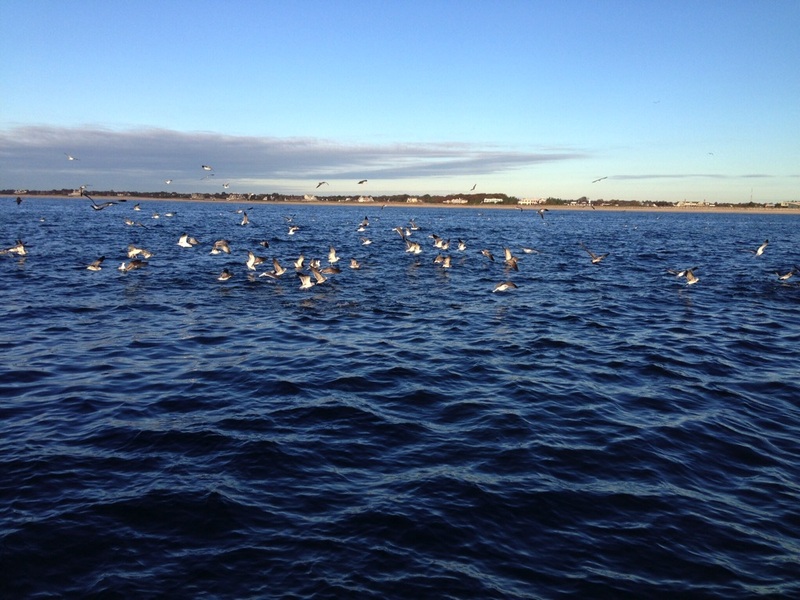 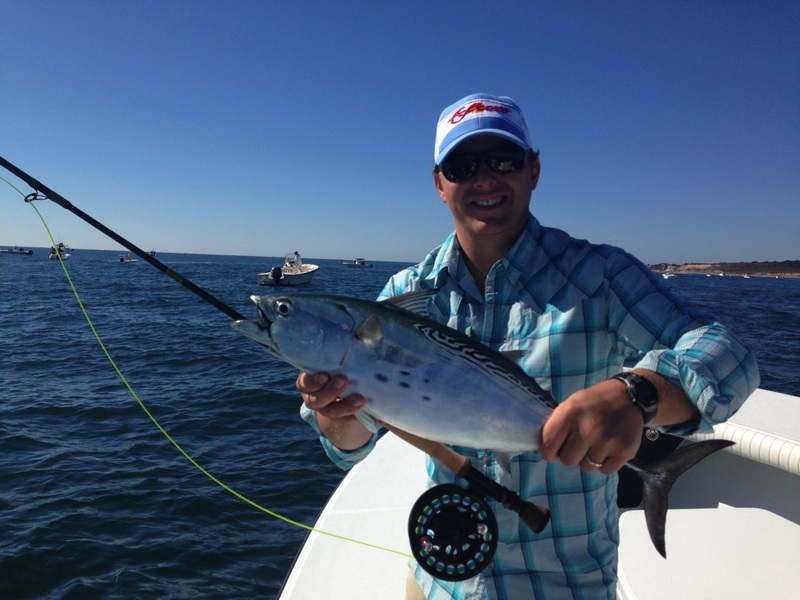 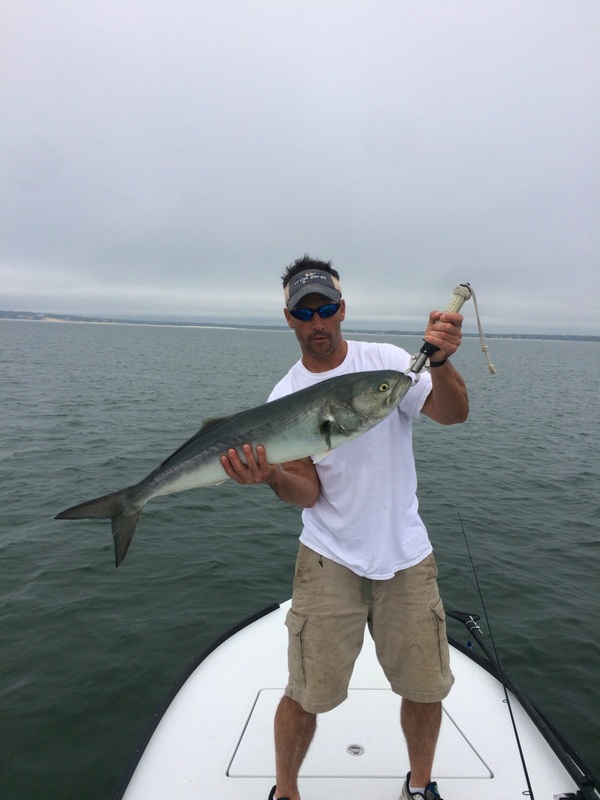 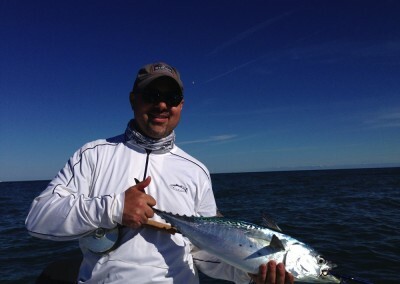 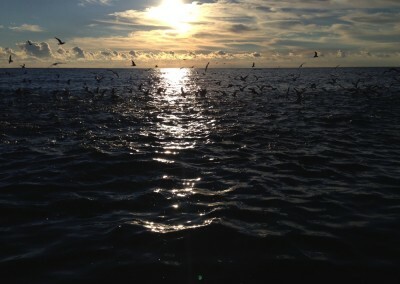 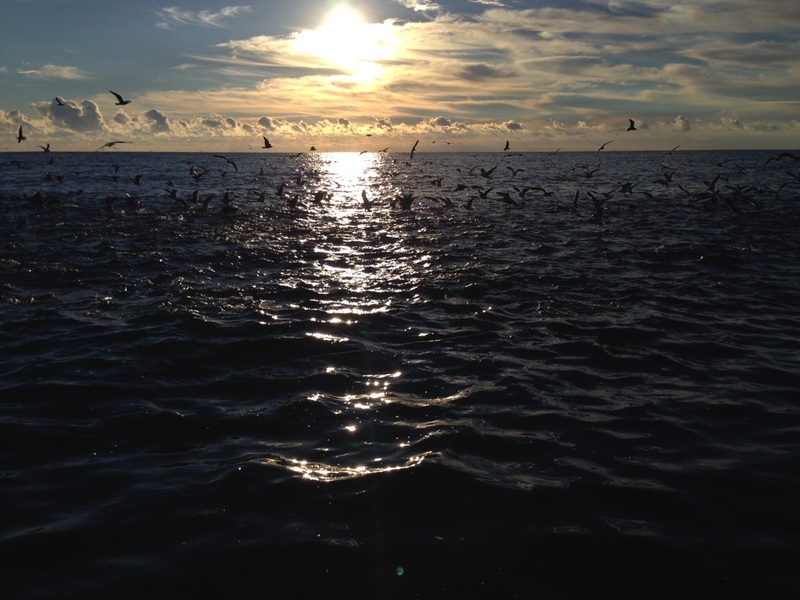 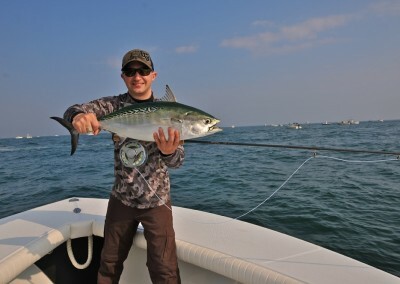 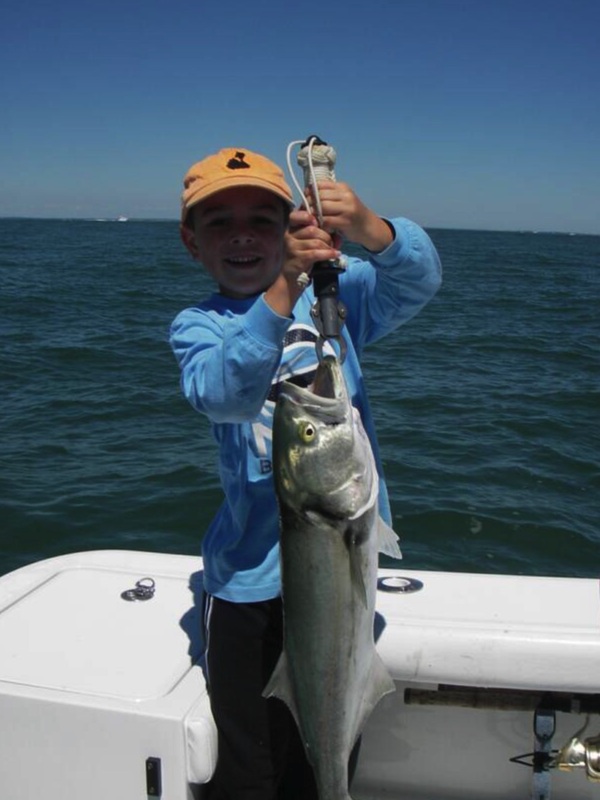 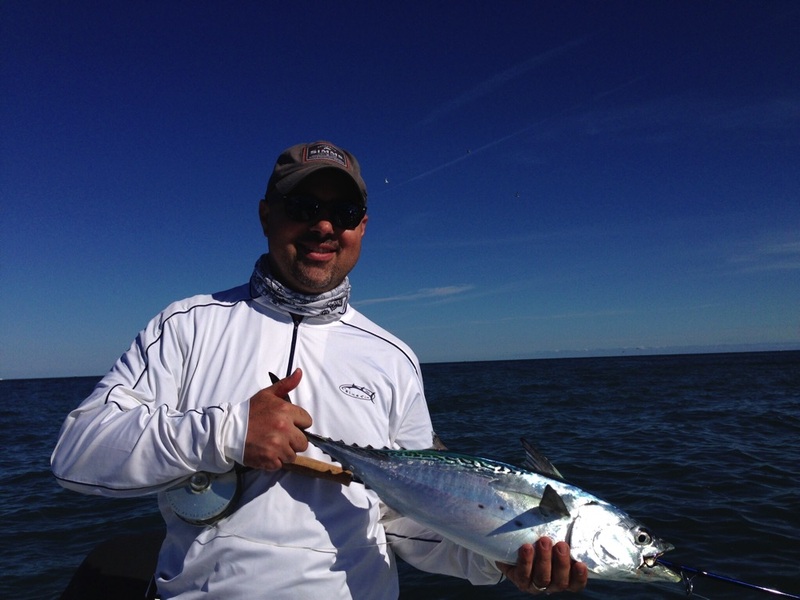 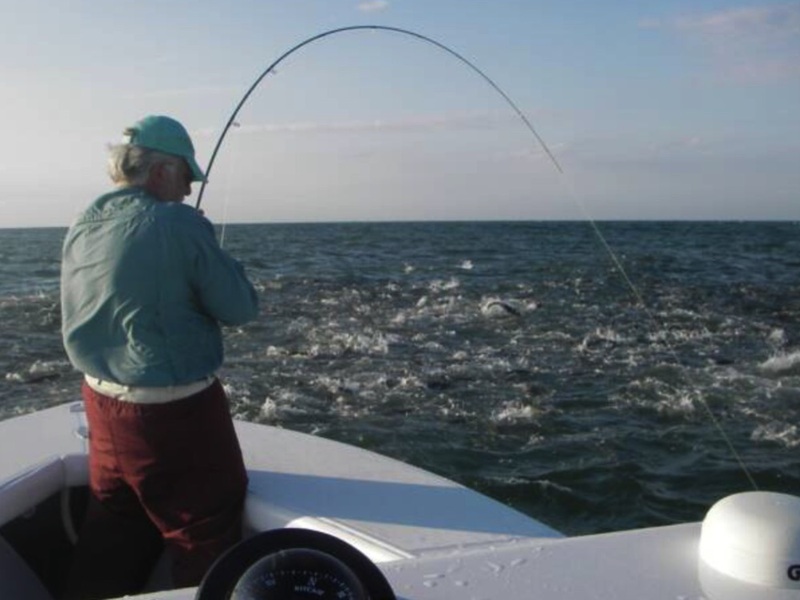 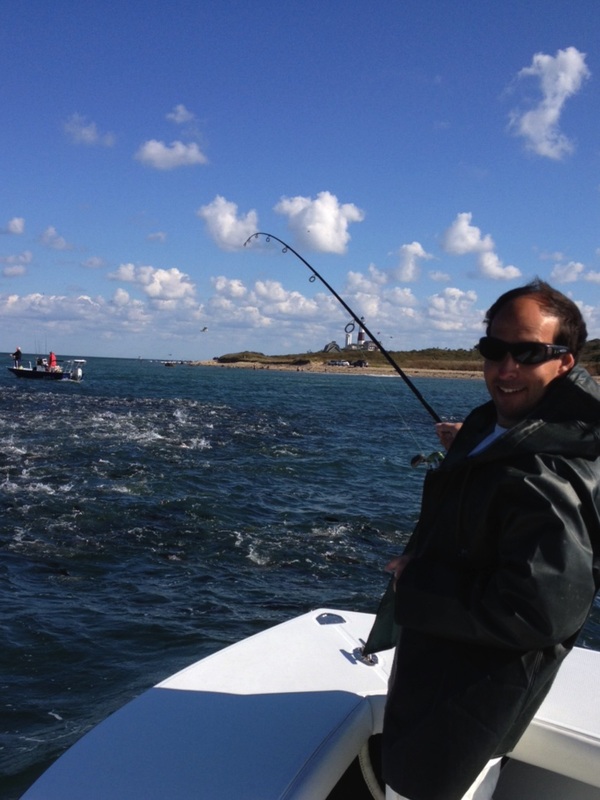 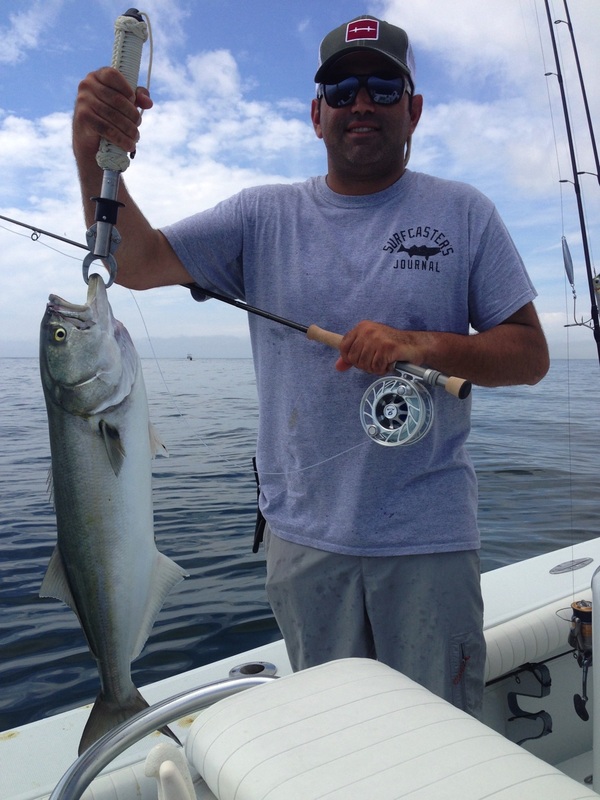 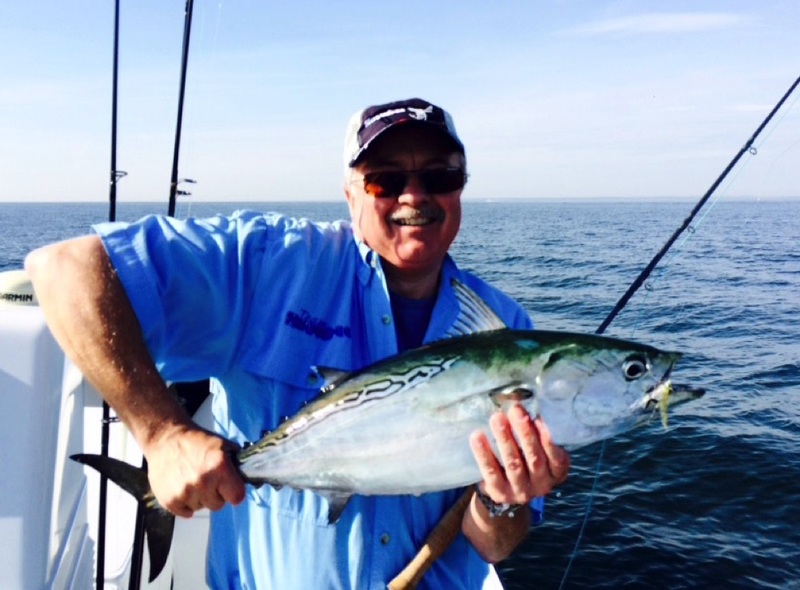 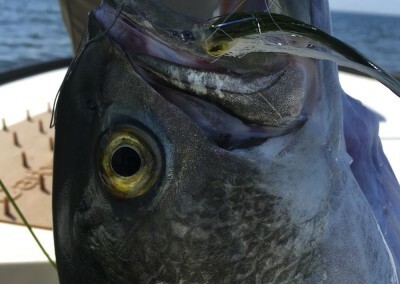 Captain White is a fully insured and U.S. Coast Guard licensed fishing guide. 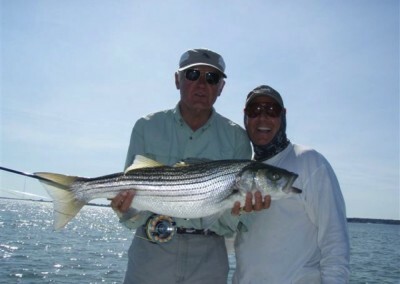 He has been guiding professionally on Long Island and in Key West, Florida for over ten years. 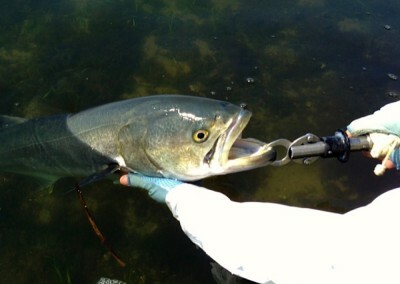 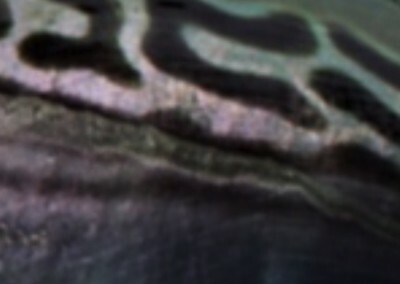 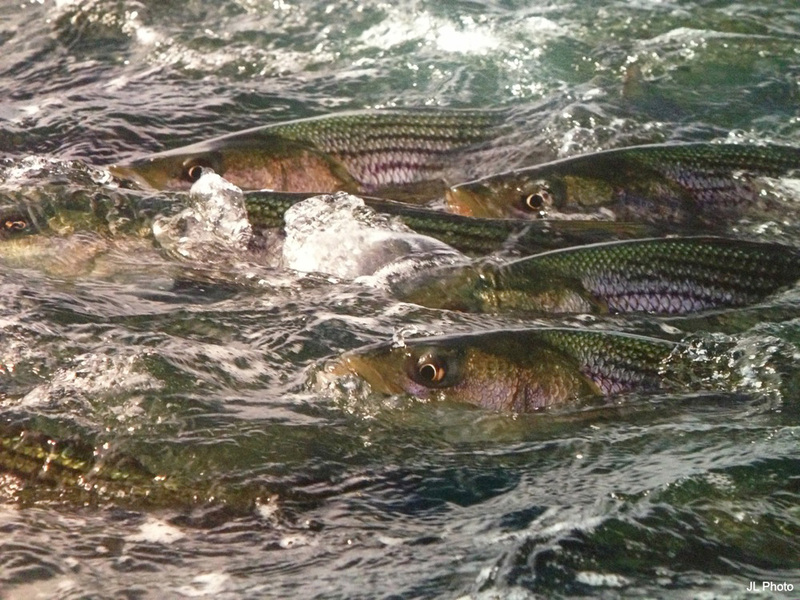 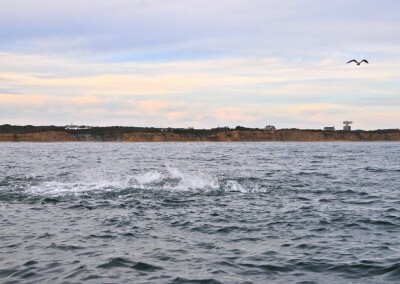 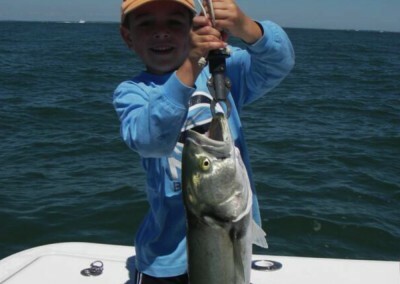 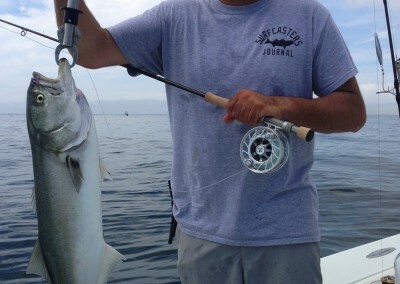 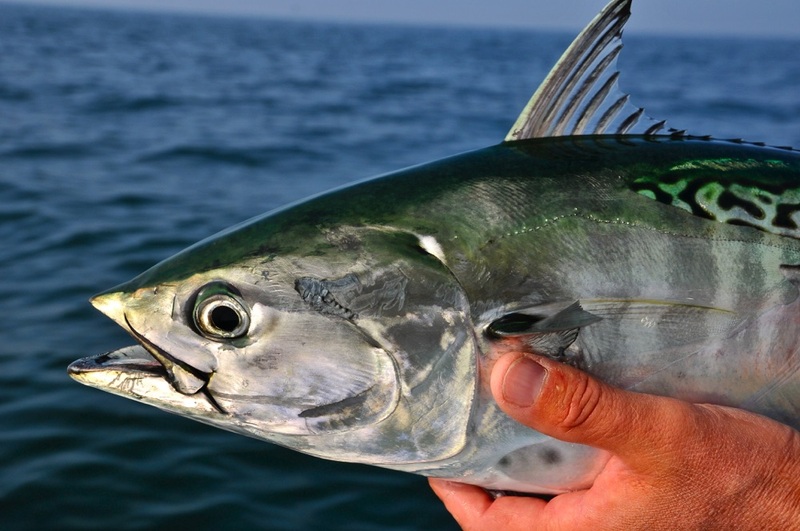 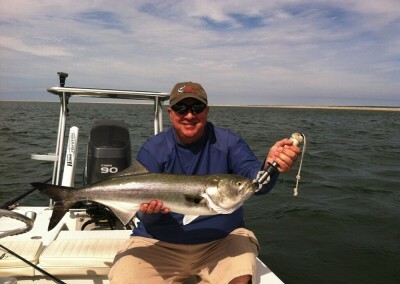 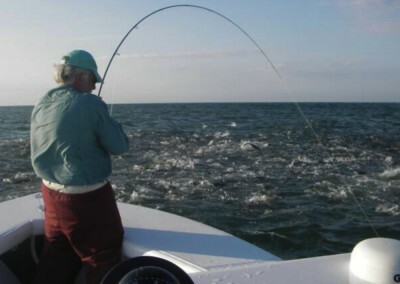 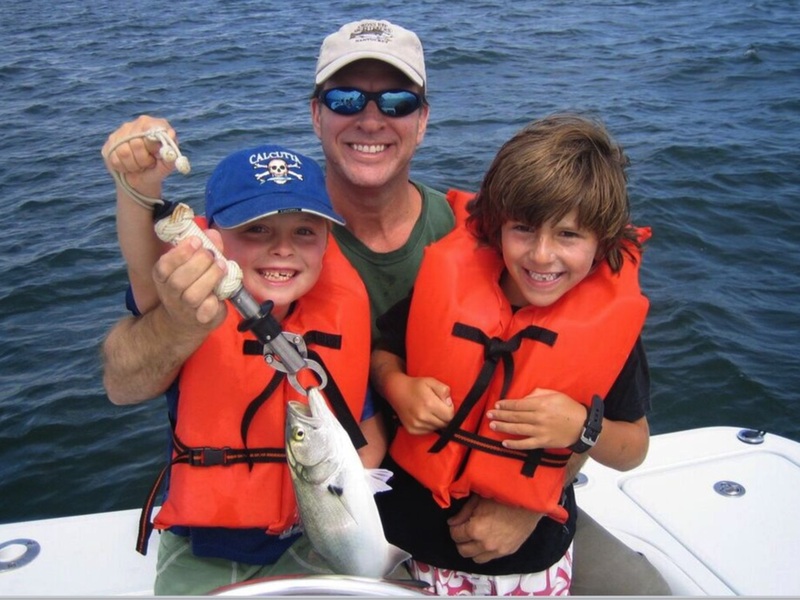 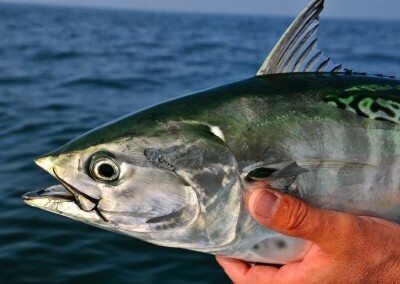 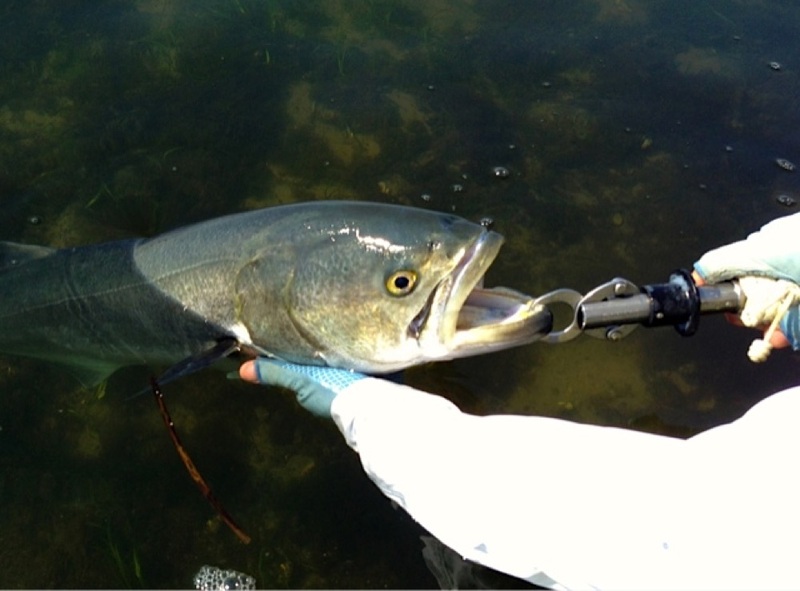 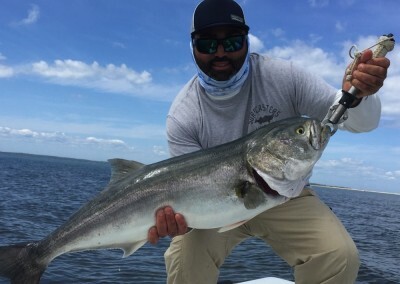 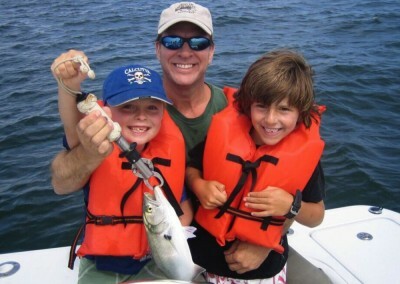 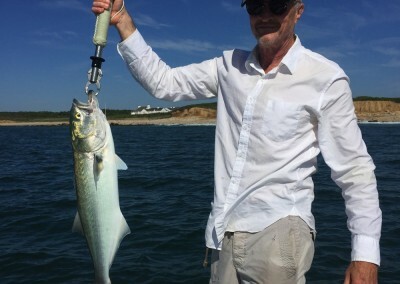 In the Spring and Summer, on Long Island, New York., Captain White fishes the shallow waters of Shinnecock, Peconic and Gardiner’s Bays in search of bluefish and striped bass. 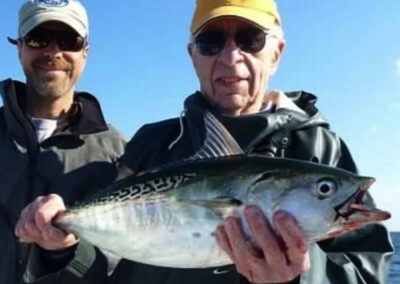 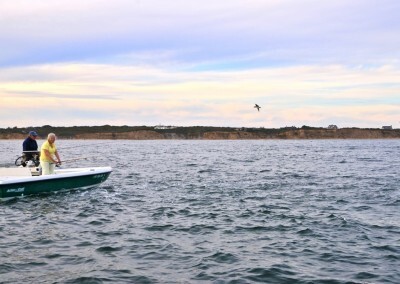 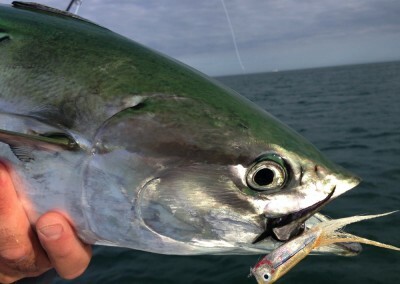 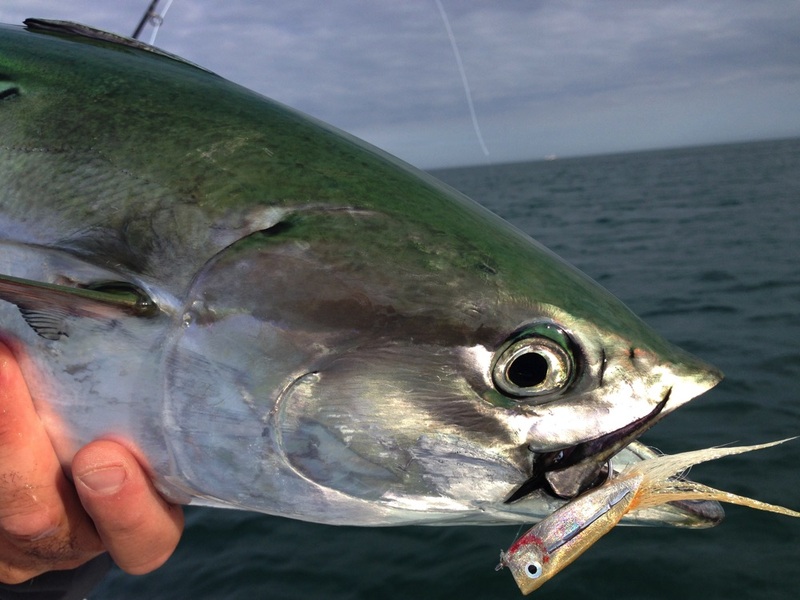 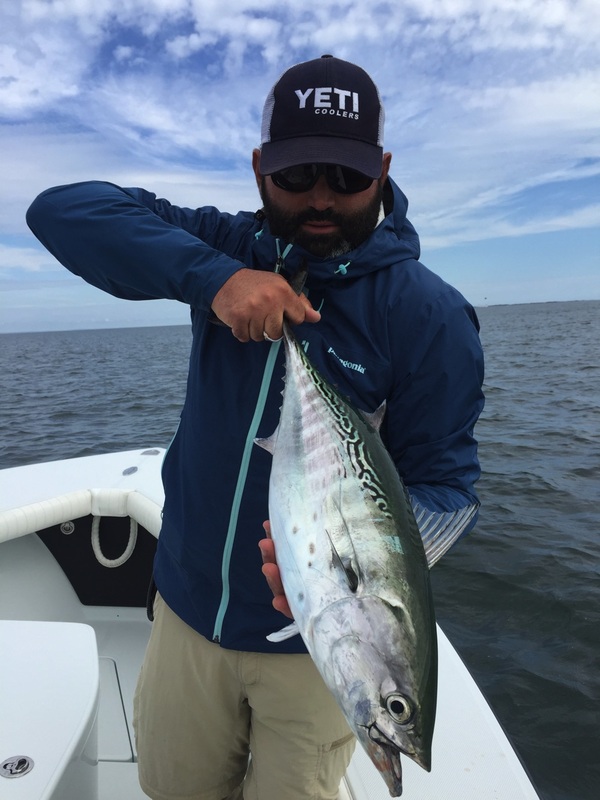 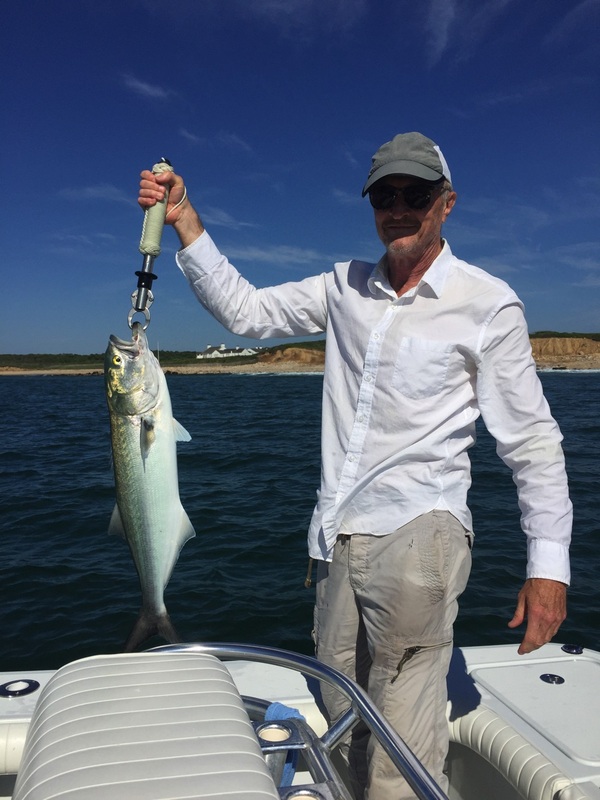 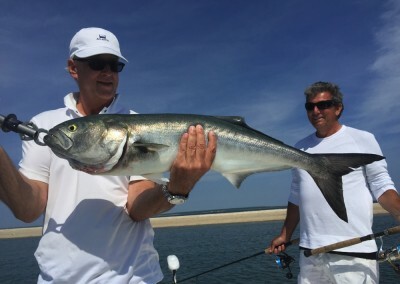 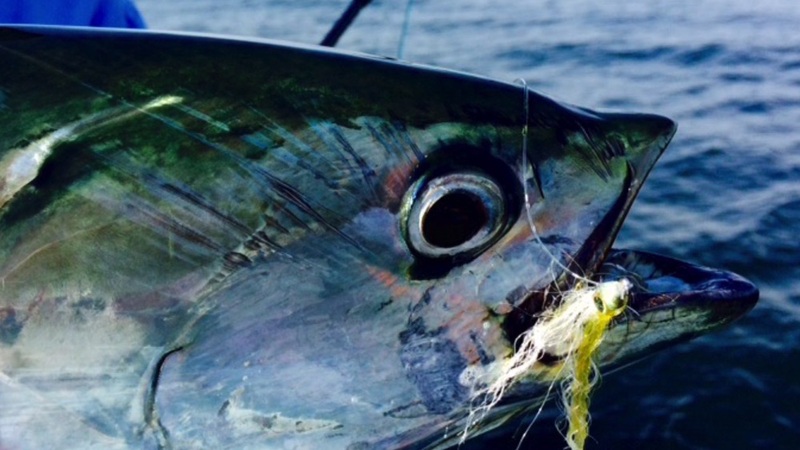 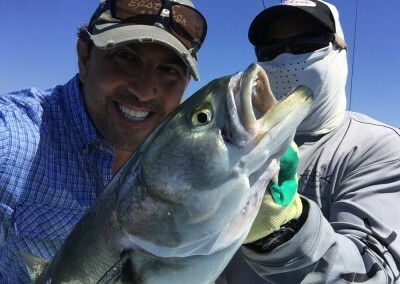 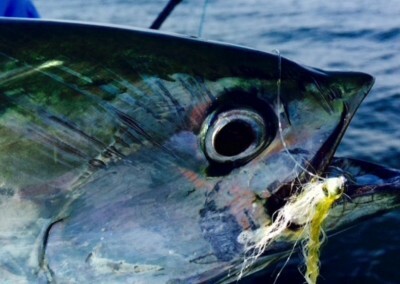 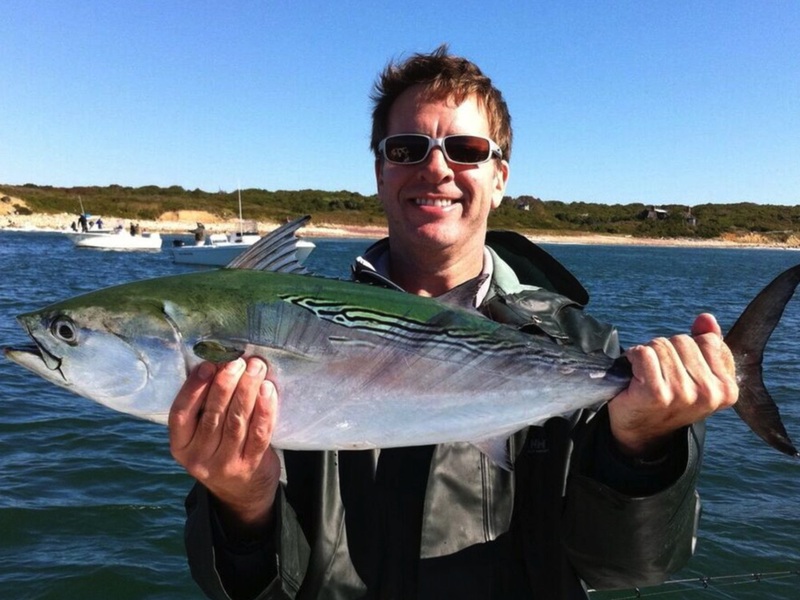 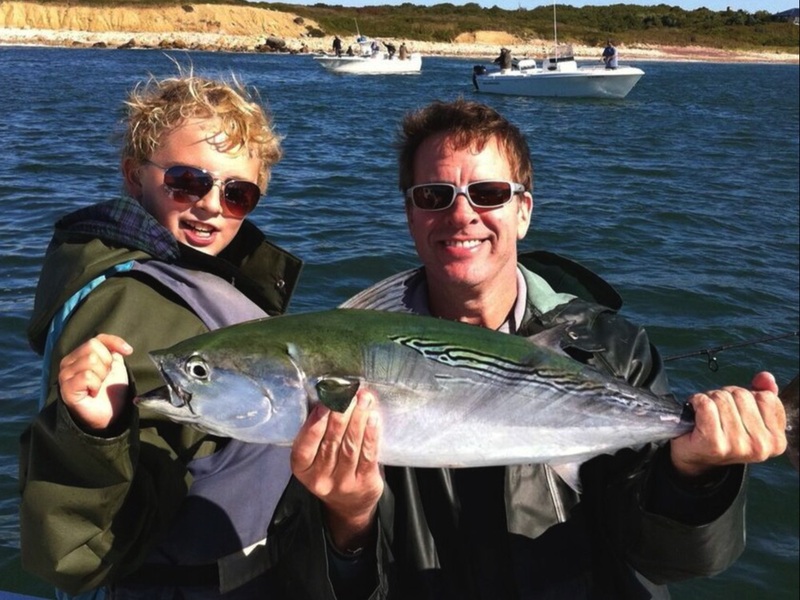 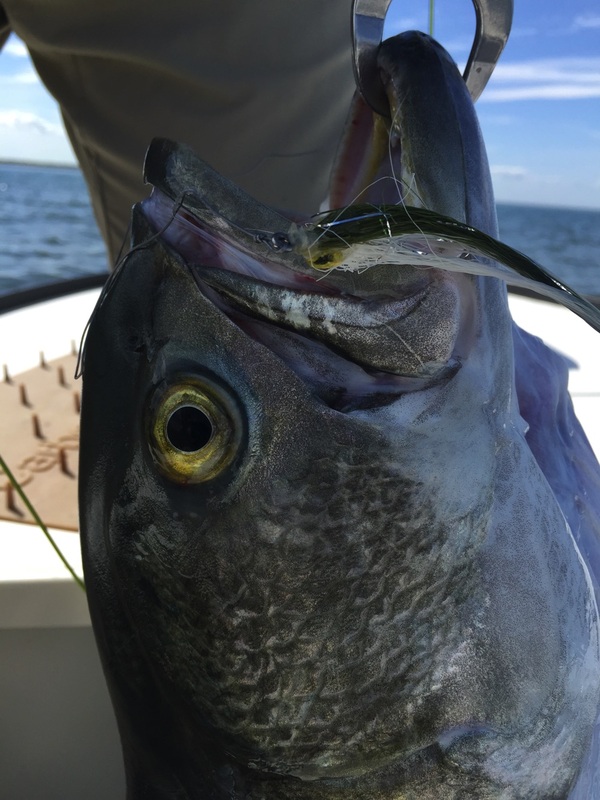 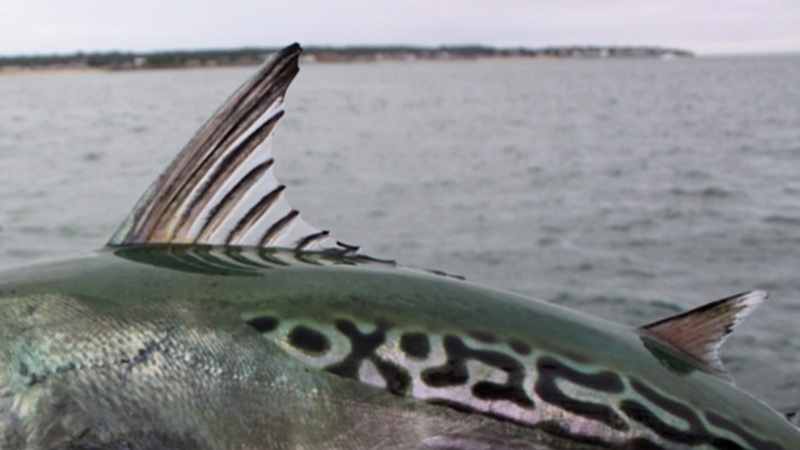 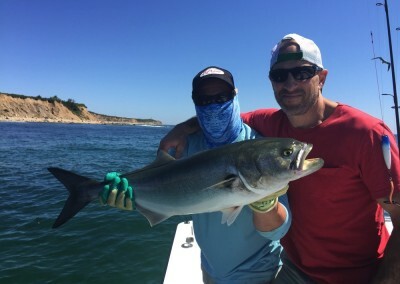 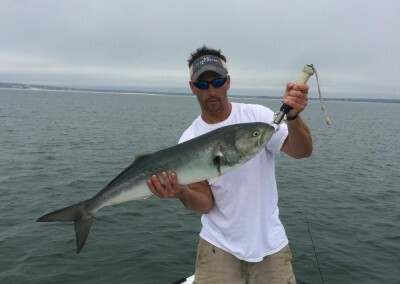 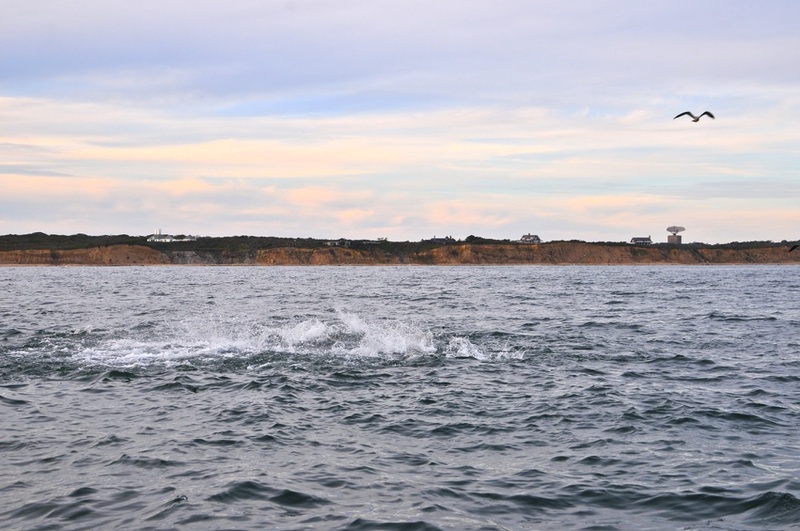 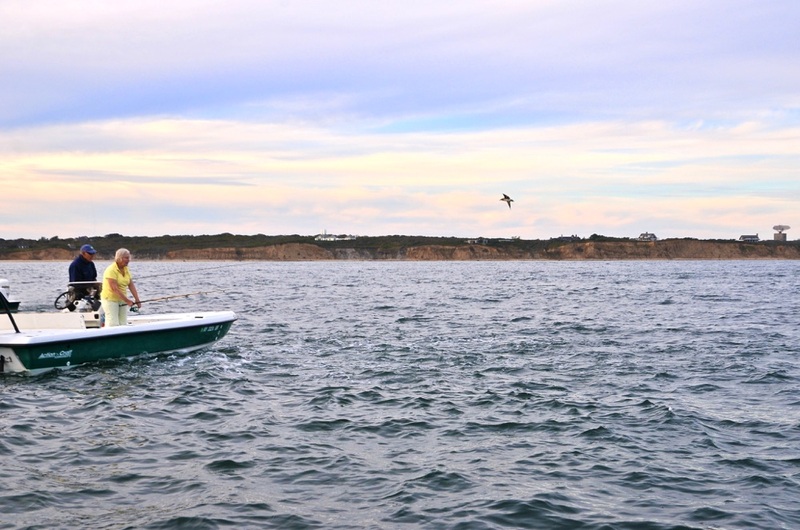 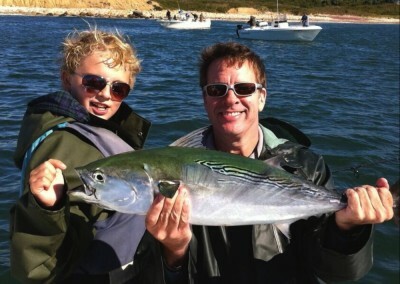 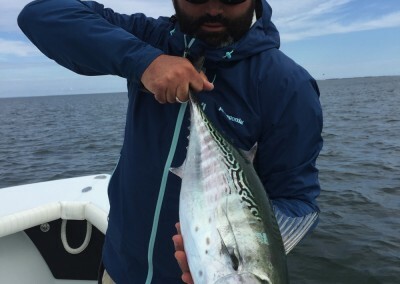 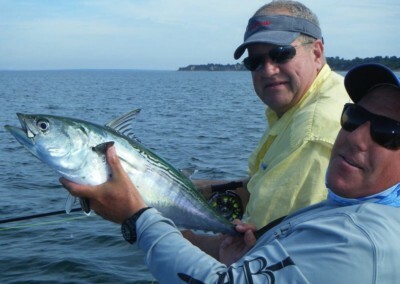 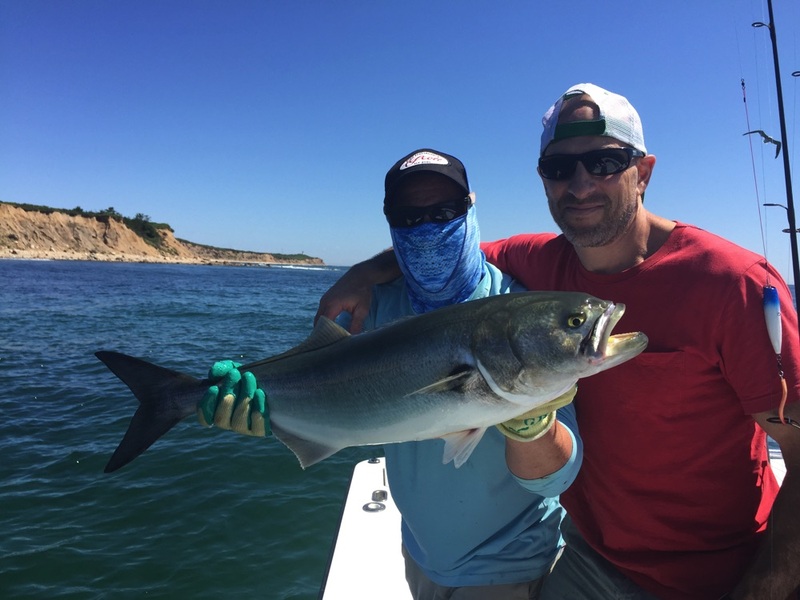 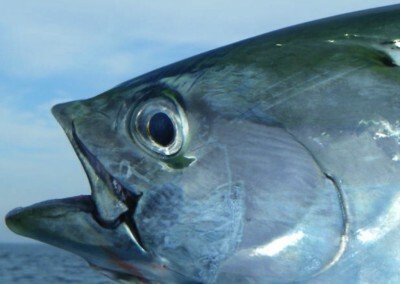 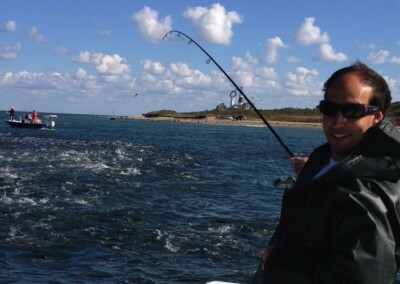 During the Fall, also on Long Island, Captain White guides in Montauk, seeking the fabled North East “grand slam”: bluefish, false albacore and striped bass. 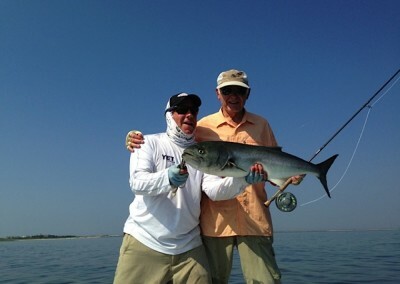 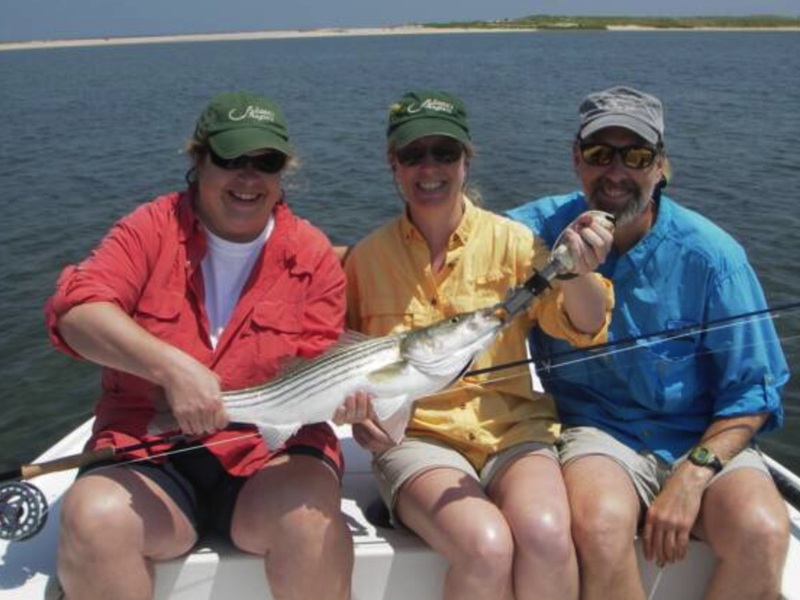 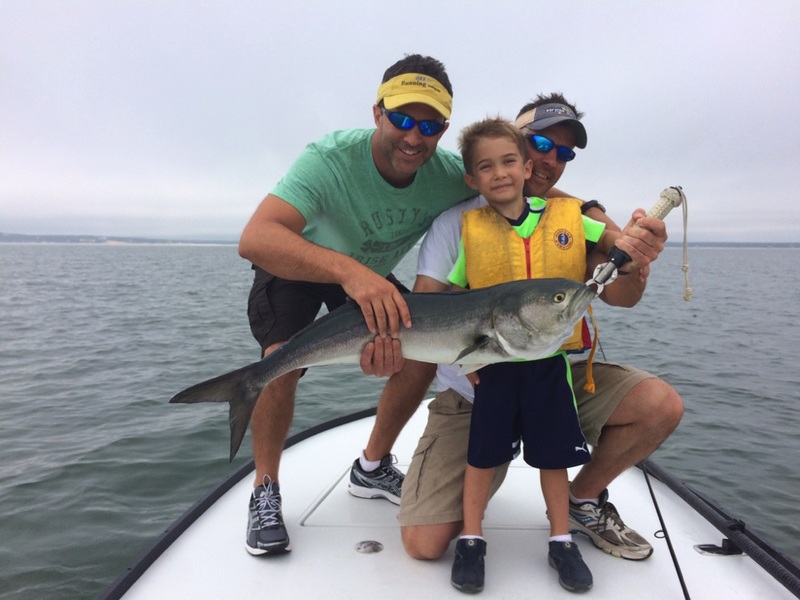 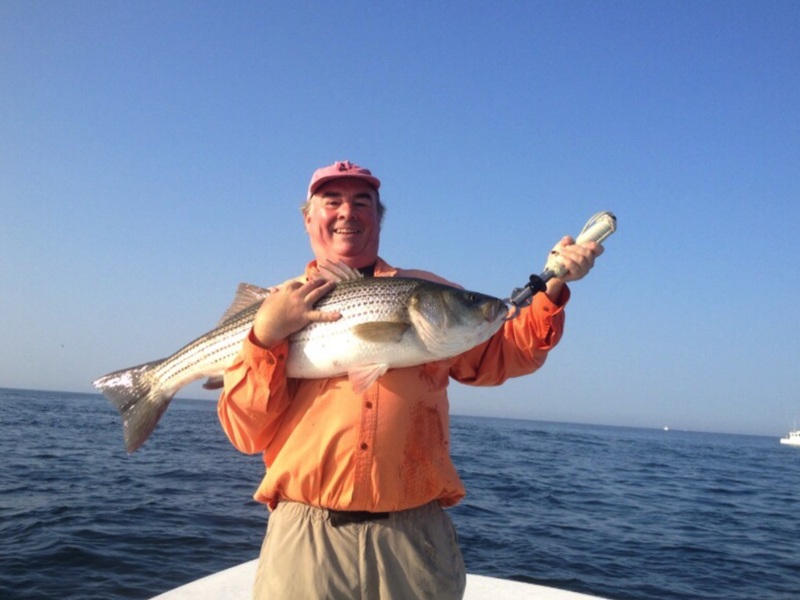 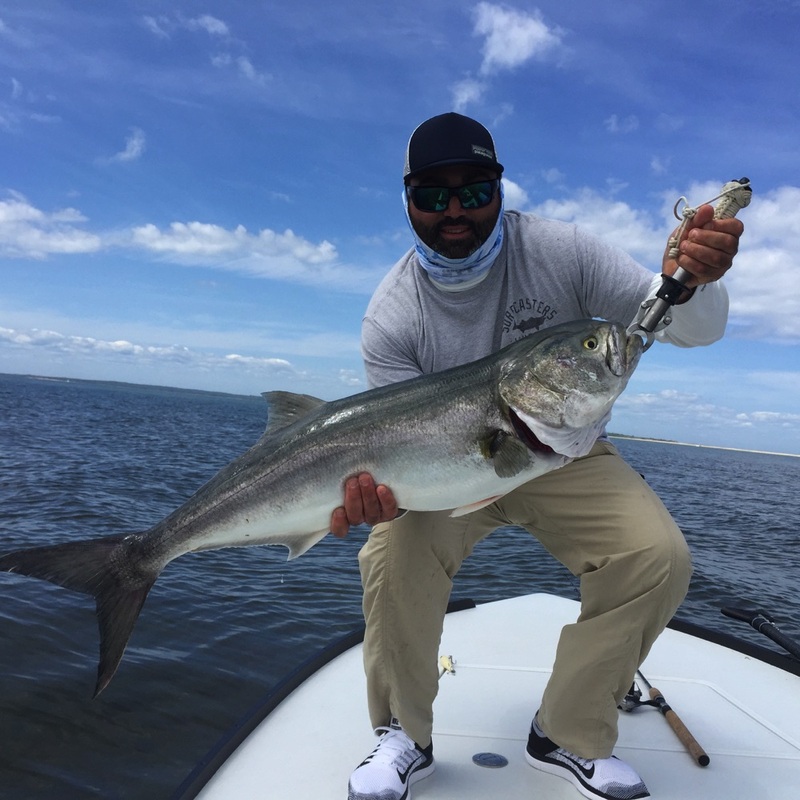 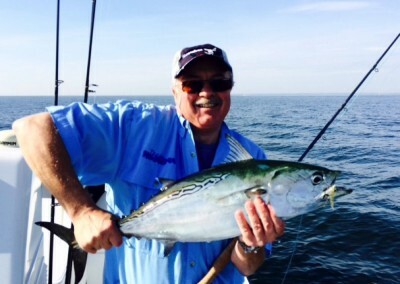 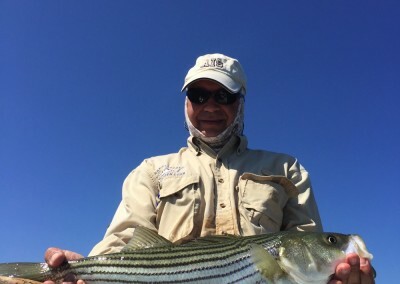 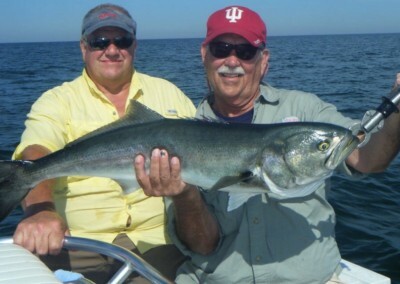 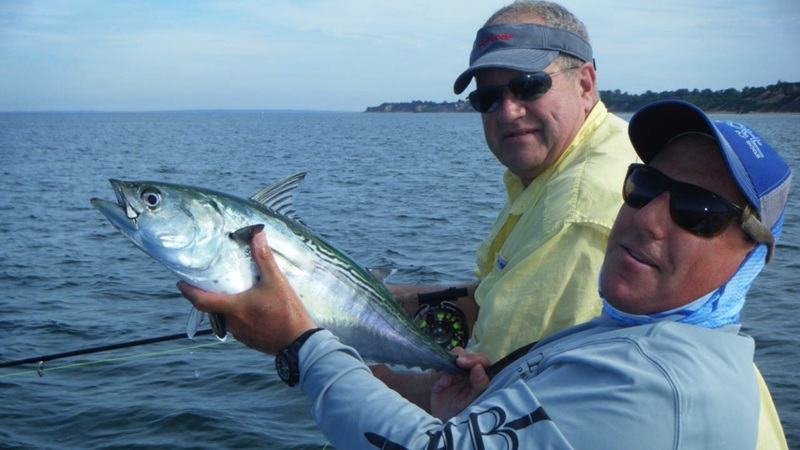 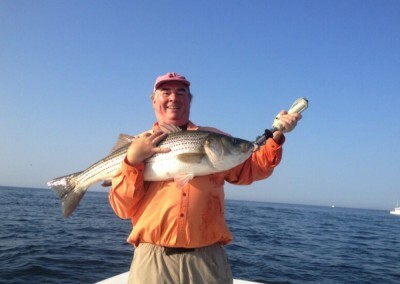 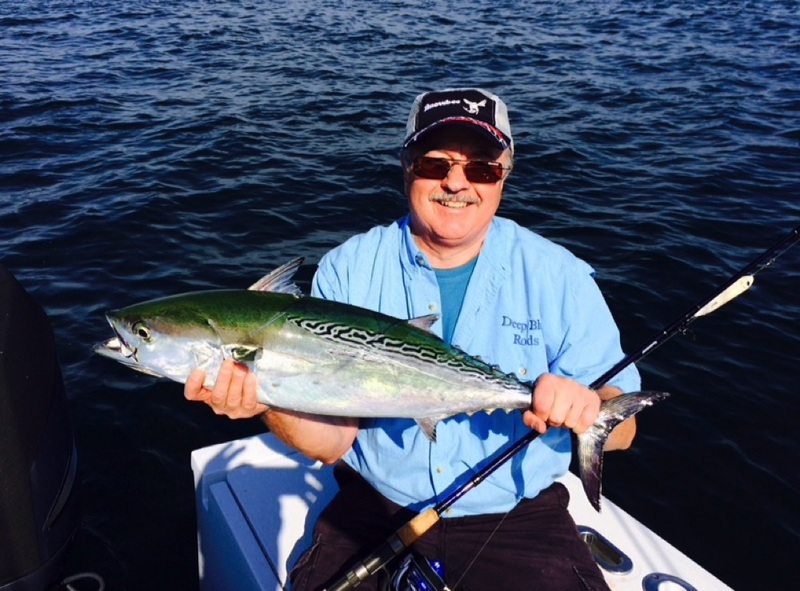 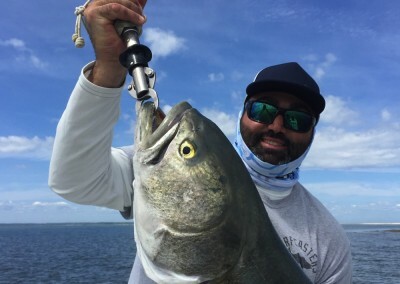 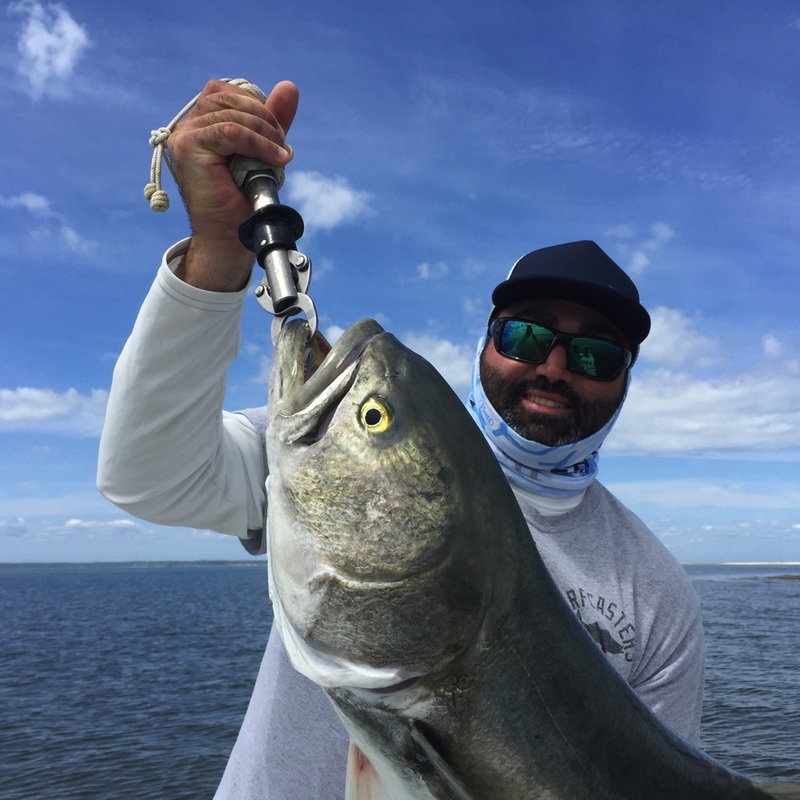 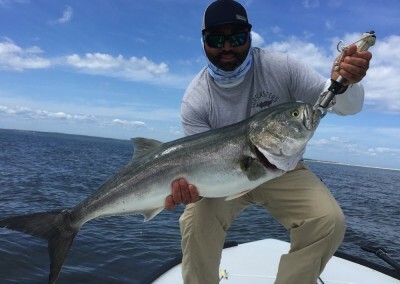 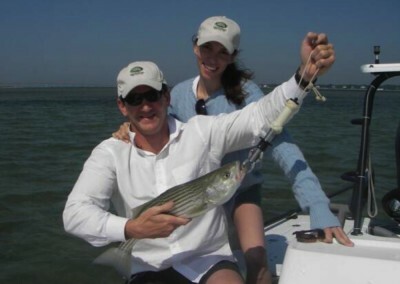 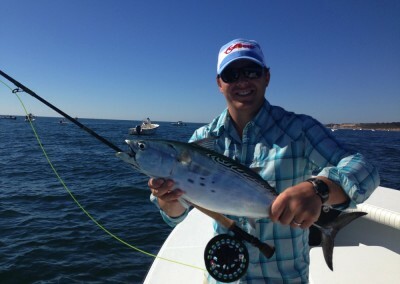 Captain Merritt White is a patient, fun loving guide who is eager to share his fishing knowledge and experience with novice and expert anglers alike. 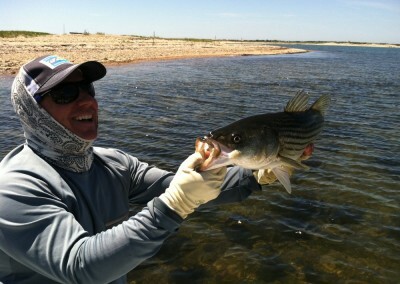 Captain Merritt is hard working and loves what he does. 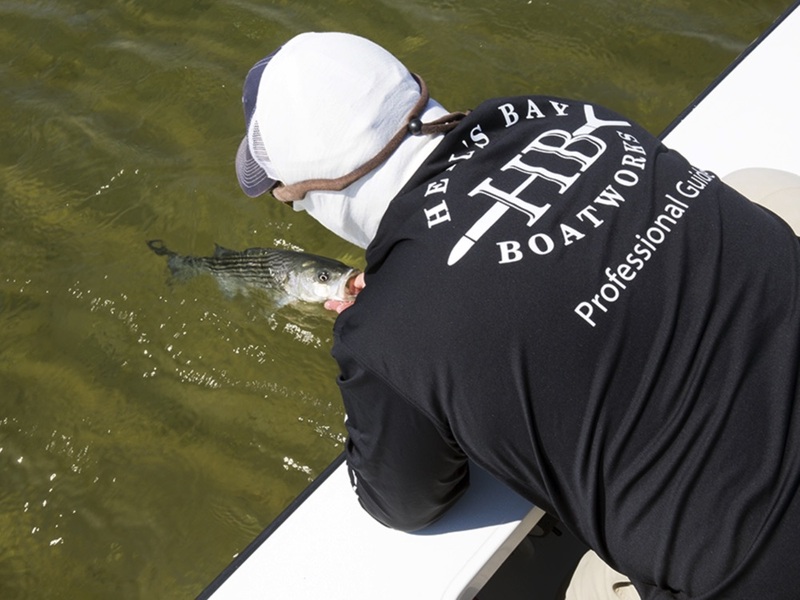 His professionalism and knowledge of the fishery always make for a day to remember. 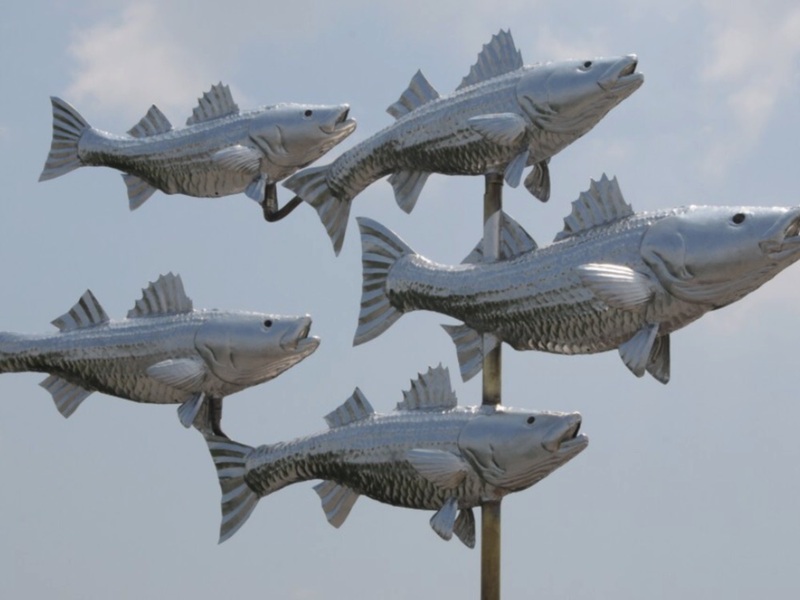 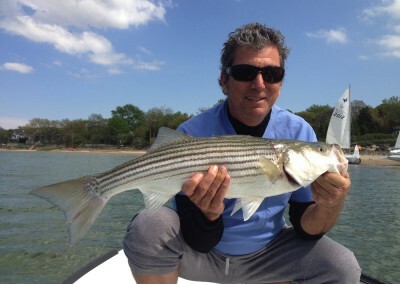 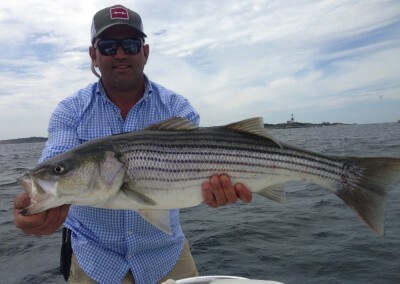 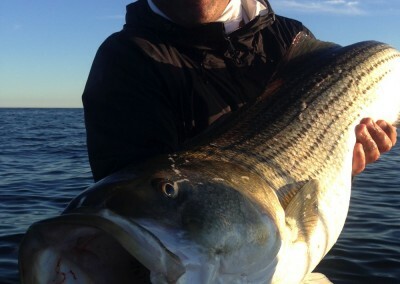 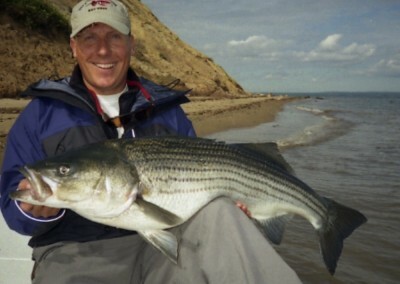 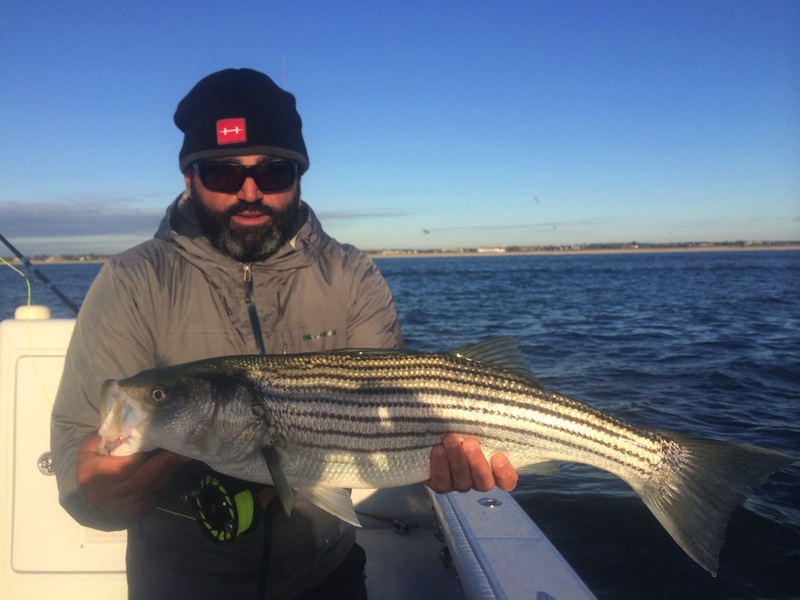 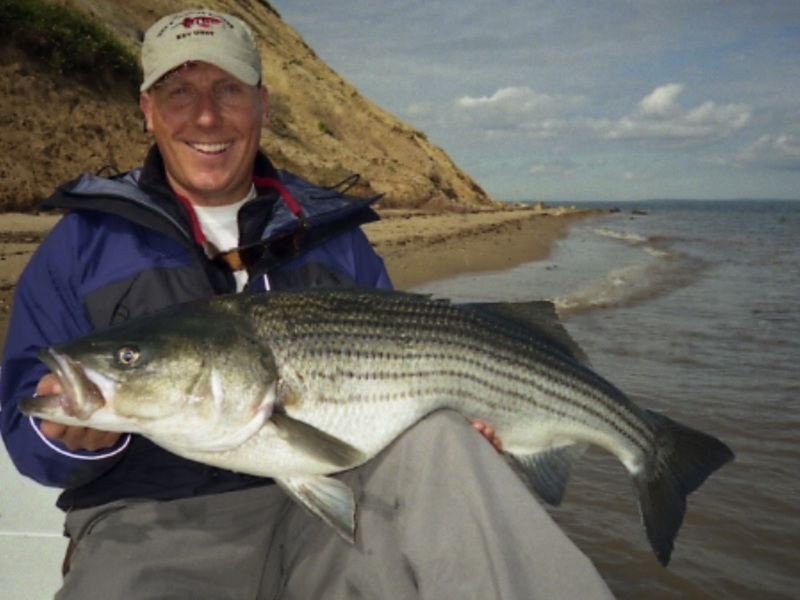 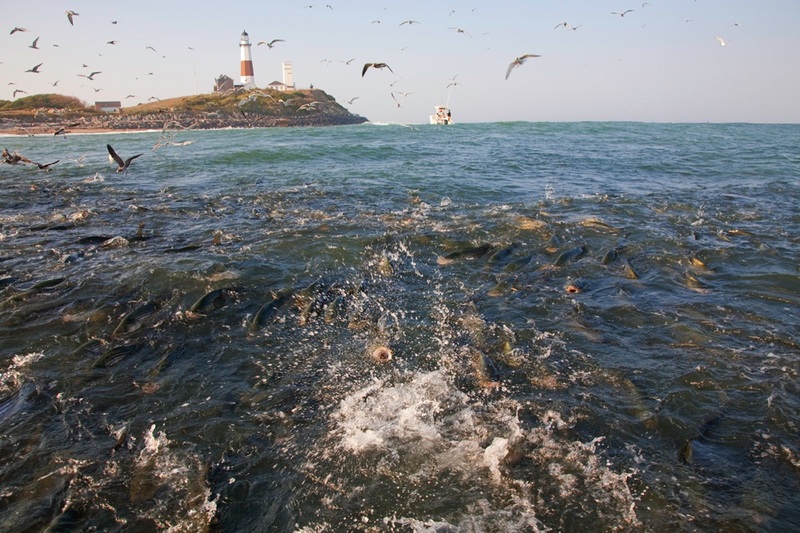 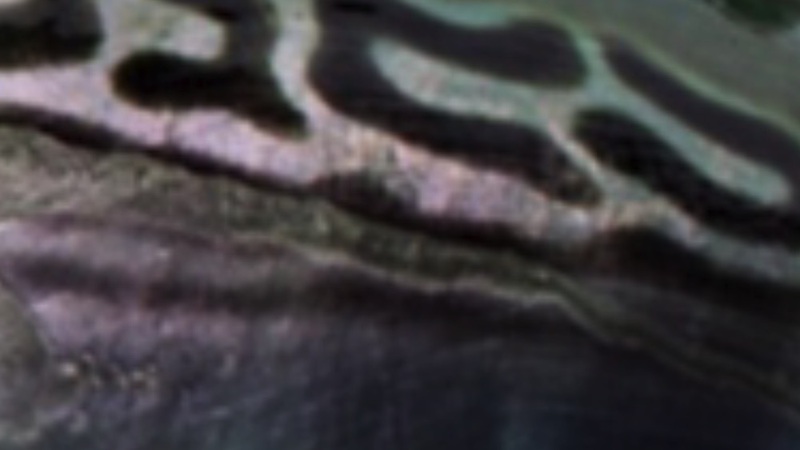 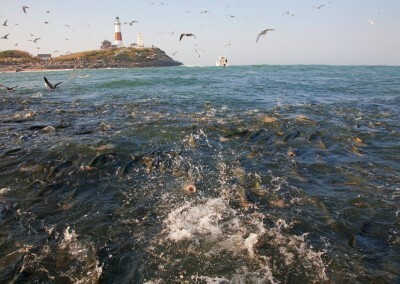 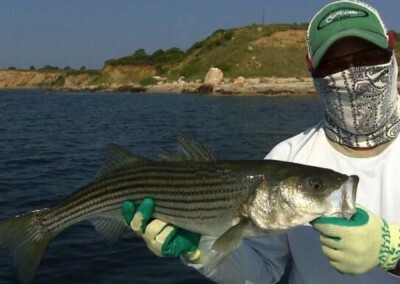 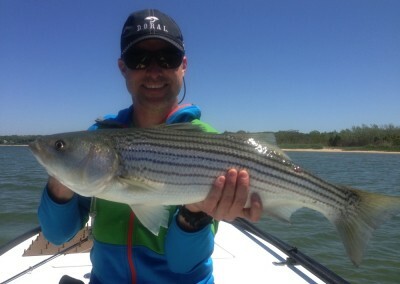 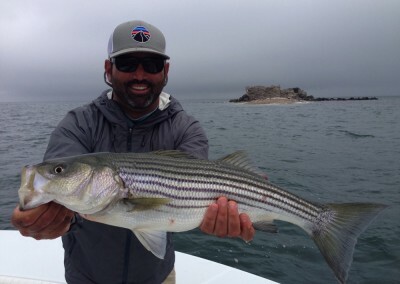 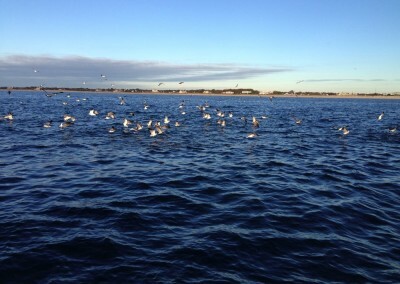 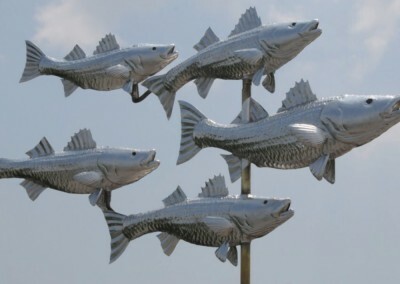 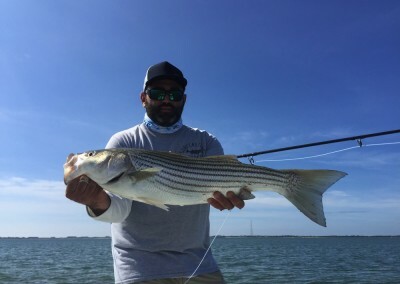 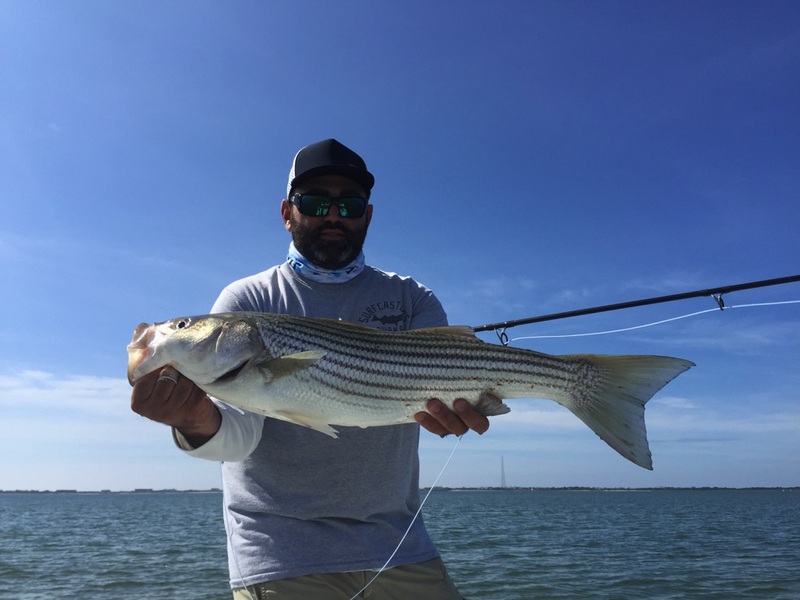 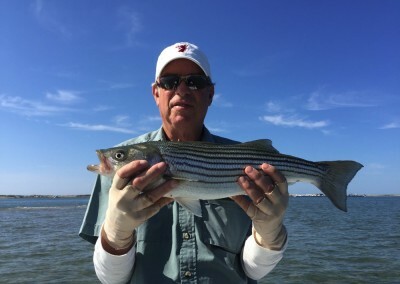 Bruno C.
The striped bass fishery on Long Island, New York has made an incredible comeback due largely to the cleansing of the Hudson River, one of the primary spawning grounds for the striper. 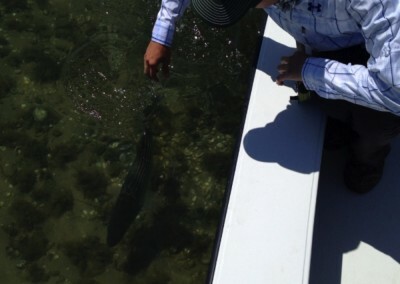 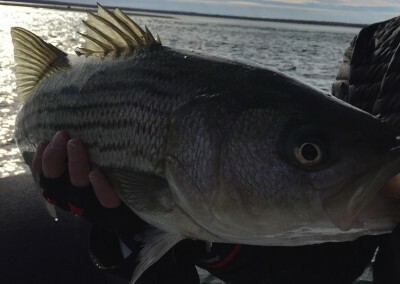 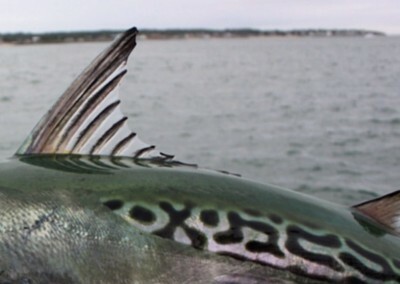 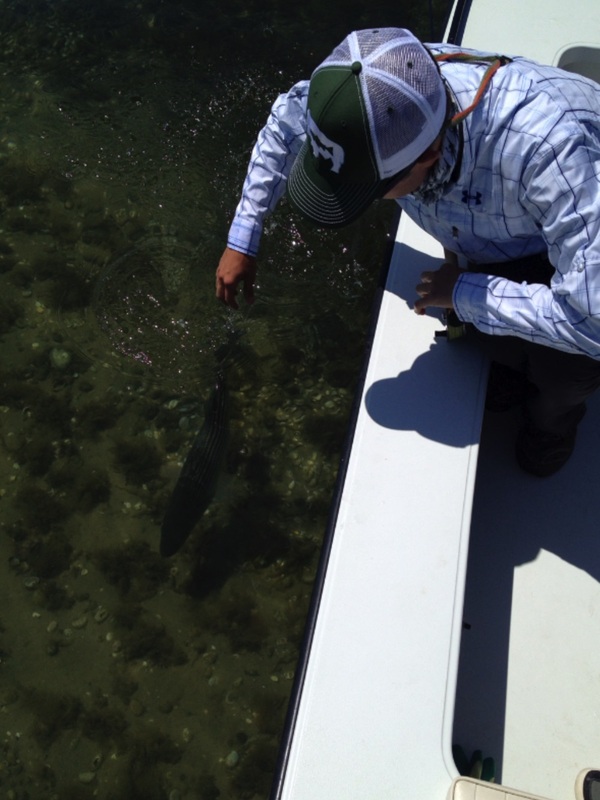 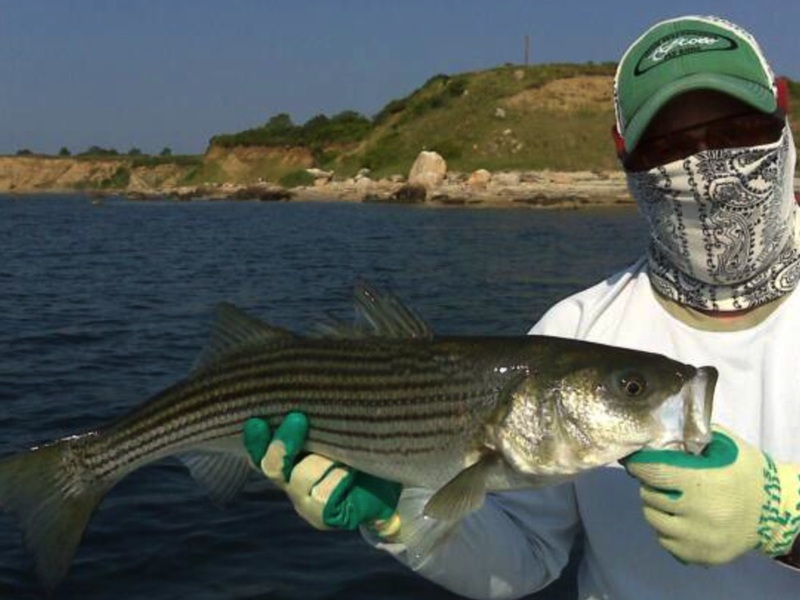 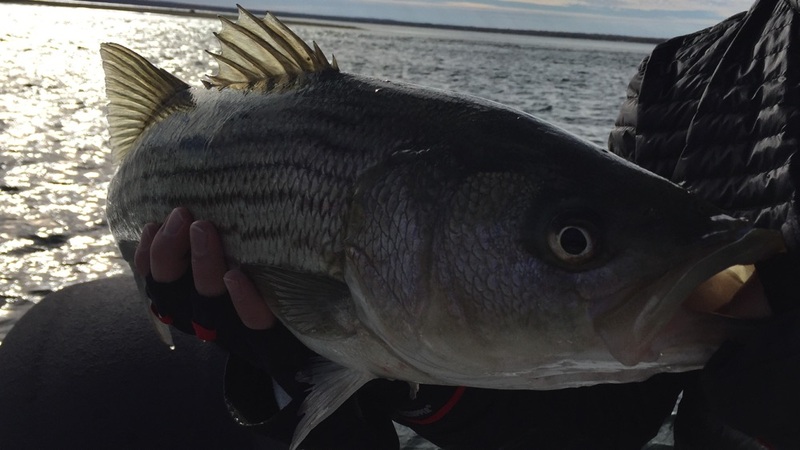 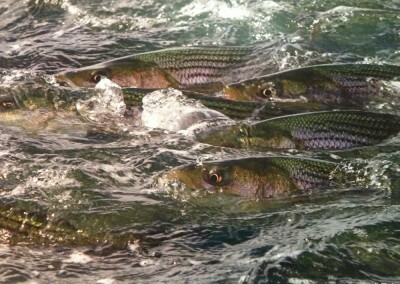 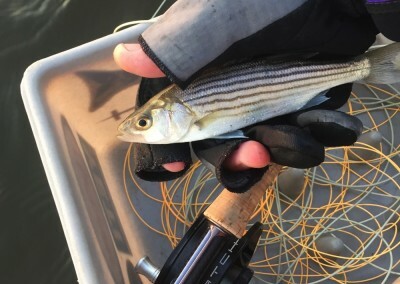 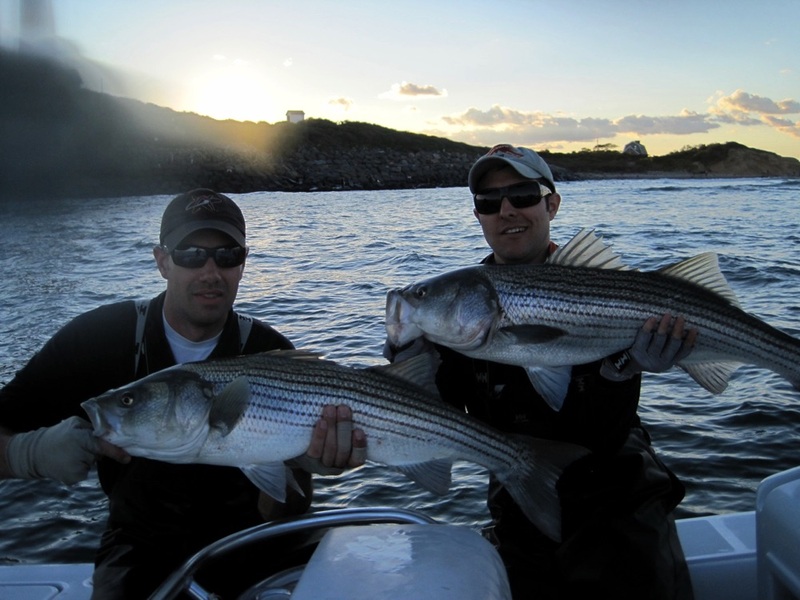 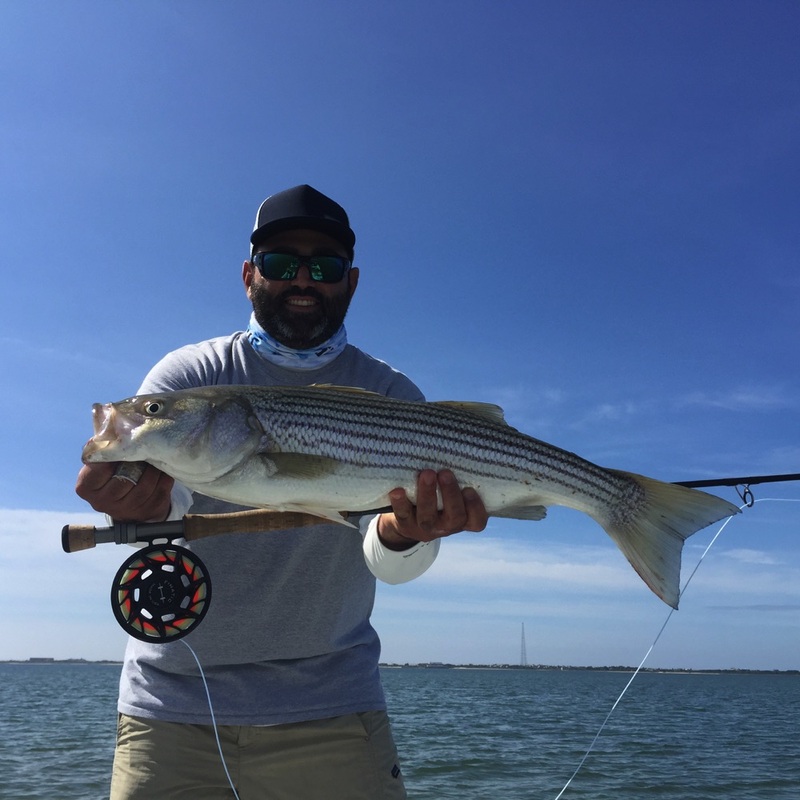 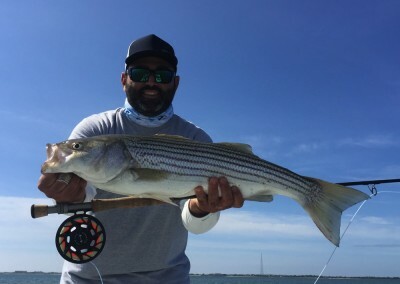 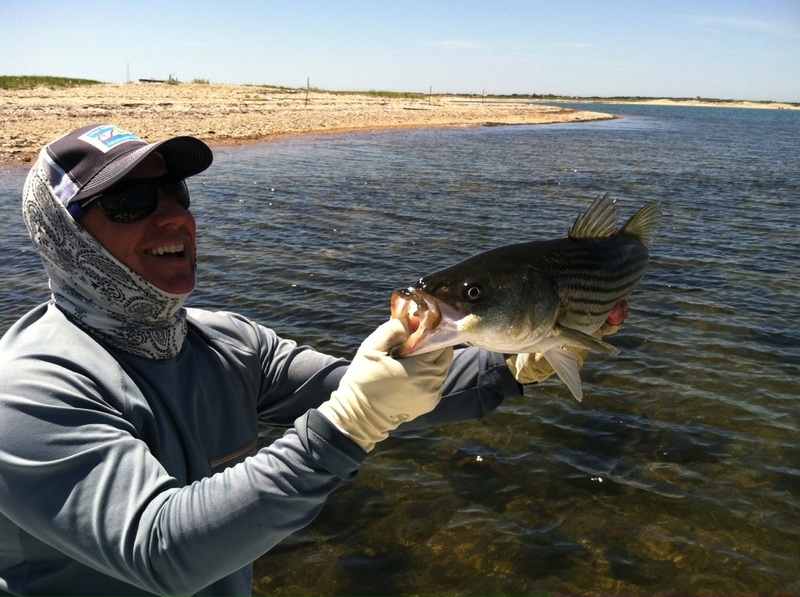 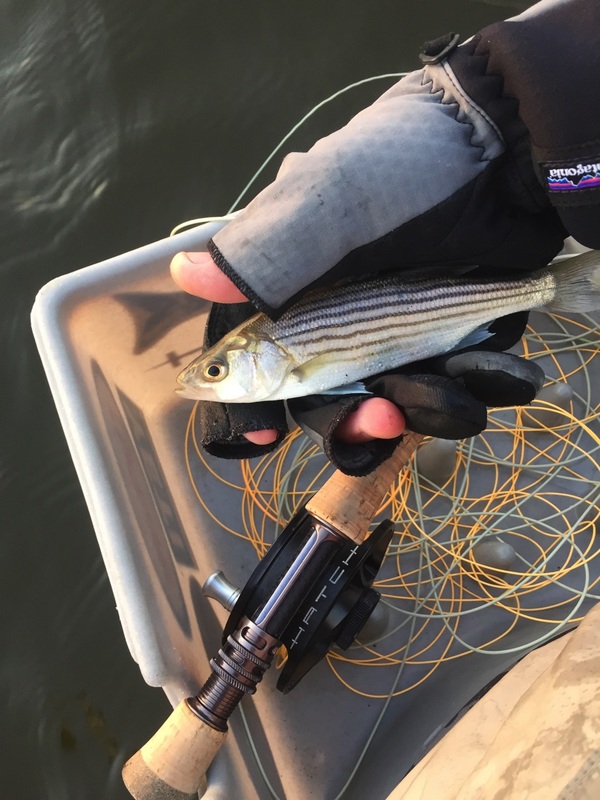 Tighter controls on the commercial harvest of the striped bass as well as those of recreational fishermen have also played a part in the burgeoning population of the striped bass in the Northeast. 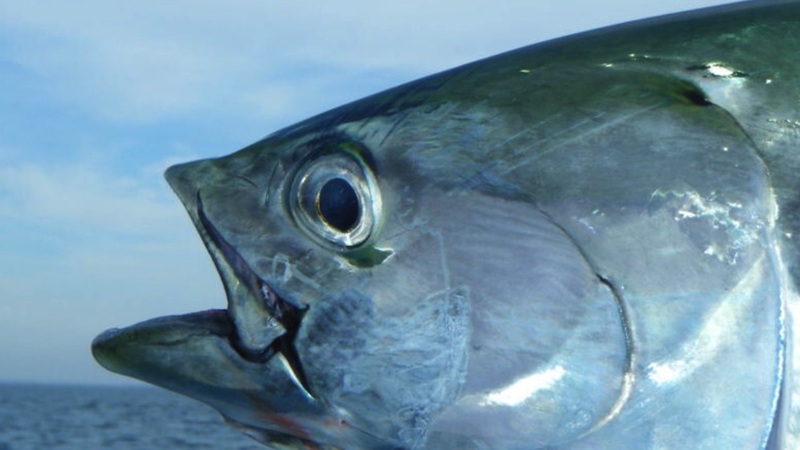 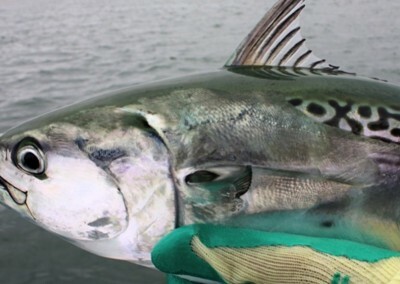 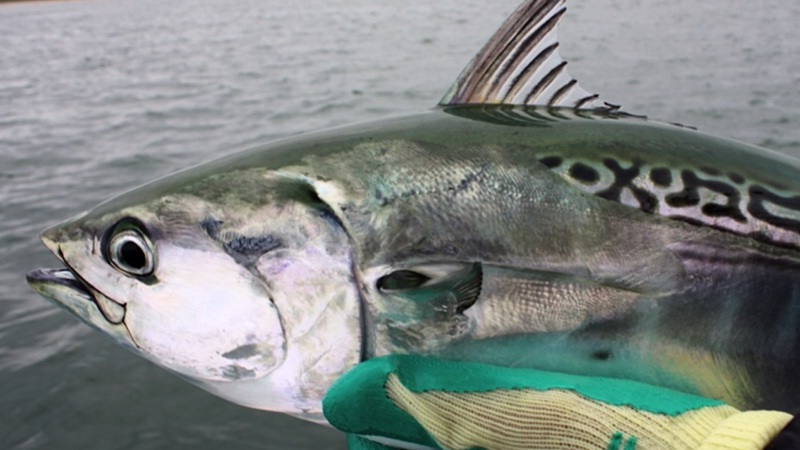 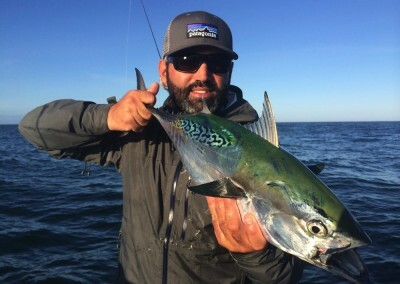 As recreational fishermen it is in our collective interest to appreciate this fishery resource for its “intrinsic value” rather than for its value on the dinner plate. 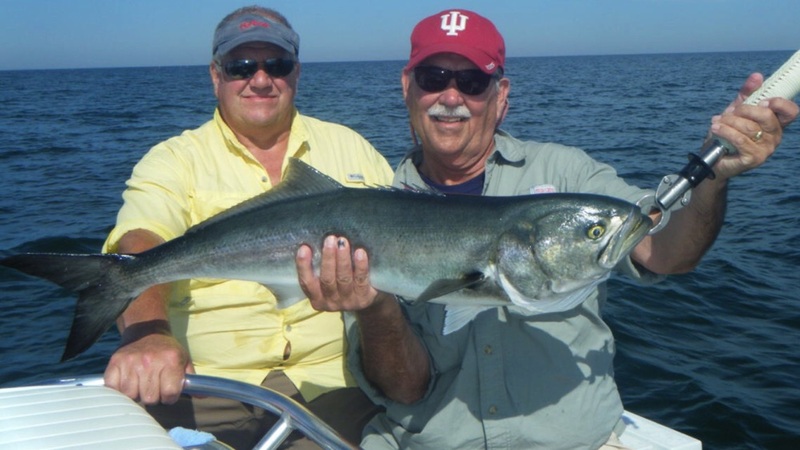 We must all realize that the fishery is much more valuable considered as a sport, a renewable resource, like trout fishermen have known for a long time. Now in growing numbers saltwater fishermen are practicing “catch and release” with the hope that future generations might enjoy the same if not greater bounties that we enjoy today.